2015 — Few sights were more welcomed during the 2016 spring than the return of the former first-team all-conference choice despite his limited status during the majority of off-season workouts ... Cleared for contact the latter half of the spring, culminating with three catches for 43 yards in the Spring Game ... Sat out while rehabilitating a serious leg injury from the 2014 season. 2014 — Emerged from the pack to claim primary tight end honors due to rangy size that's an asset as a receiver as well as his prowess at the line of scrimmage ... The first-team Pac-12 all-conference honoree finished tied for second-most touchdown receptions on the team (6), despite missing the last five games due to a significant leg injury at Utah ... Also the recipient of the Duane Cargill Memorial Award as the Ducks' Outstanding Offensive Impact Player as he paced Oregon tight ends with 25 total receptions for 420 yards - the program's most receiving yards by a player at that position in three years ... Caught a season and career-high five passes for 84 yards and a touchdown at UCLA, then surpassed his single-game receiving yards mark the following week vs. Washington, accumulating 99 yards, including a 66-yard career-long reception, on three catches ... Led the team in receiving against Wyoming, UCLA and Washington ... Credited with receptions in all but one of his 10 appearances. 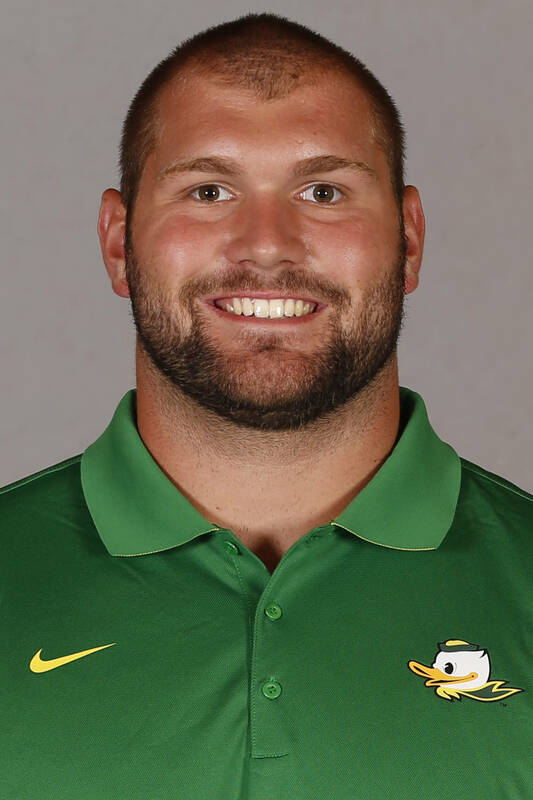 2016 — Graduated from high school early in order to facilitate enrolling at Oregon in time for the start of the spring term ... Benefitted from the tutelage of a trio of senior tight ends during spring drills and demonstrated an accelerated grasp of the offense in a short amount of time . . . An abundance of quality and quantity at the position will enable him to progress at a rate he is comfortable with and allow time for him to physically and mentally mature before being thrust into the middle of competition. 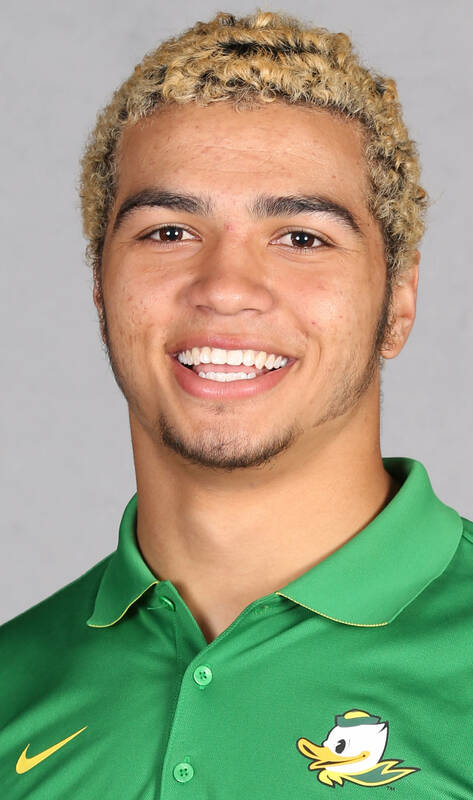 BEFORE OREGON — All-purpose player who saw time as a running back, defensive back, and kick returner . . . Named first team All-County all-purpose as a senior . . . 2013 All-Trinity League Offensive MVP . . . 2013 JSerra Varsity MVP . . . Named the No. 3 Player to Watch by the Orange County Register . . . First team All-State and first team All-Trinity League as a junior . . . Selected to Cal-Hi Sports All-State at defensive back in 2012 . . . First team All-Orange County and first team All-Trinity League in 2012 . . . 2011 first team All-Trinity League at running back . . . 2011 all-state at running back and defensive back. 2016 — Recorded three cathces for 52 yards and one touchdown in the 2016 season opener against UC Davis. 2014 — Jumped out to a good start yet injuries helped derail his momentum until the latter part of the year ... Stepped onto the field for 13 of 15 games, latching onto both of his 2014 receptions (29 yards) in the season opener against South Dakota ... Took part in a season-best 33 snaps vs. Wyoming ... Also took part in 30 plays in the Pac-12 Championships. 2015 — Benefitting from the season's absence of program's all-conference tight end, the 13-game starter put together his best numbers of his career ... 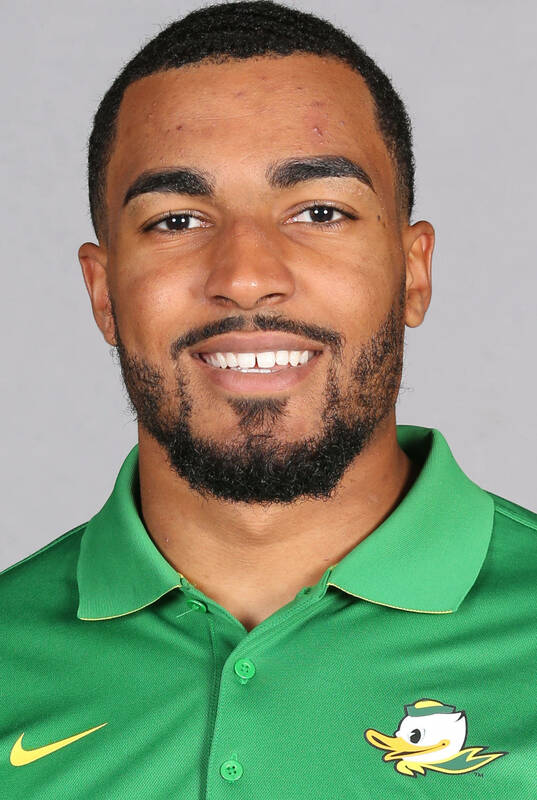 The team's sixth-leading receiver finished the year with 16 catches for 229 yards and one touchdown, stretching his yards-per-catch average to the Ducks' fifth-best (14.3 avg.) ... 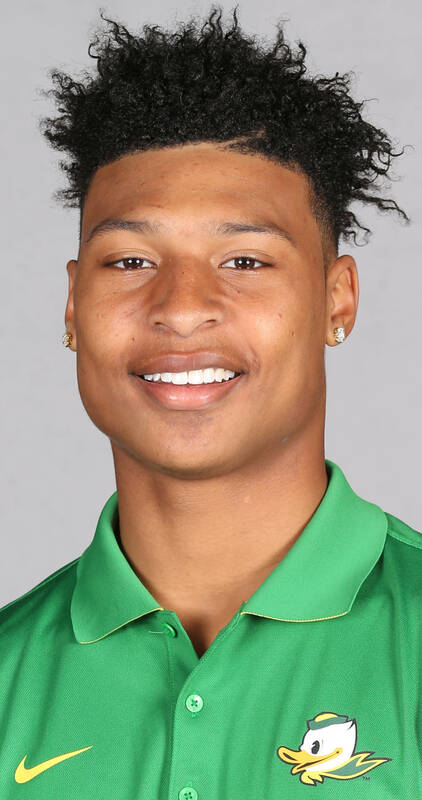 Caught a pair of passes in each of the Ducks' first four games, including 23 receiving yards vs. Utah ... Latching onto passes in 10 of 13 appearances, he was credited with two receptions for 62 yards and his lone score of the year in the win over USC, including a career-long of 52 yards ... 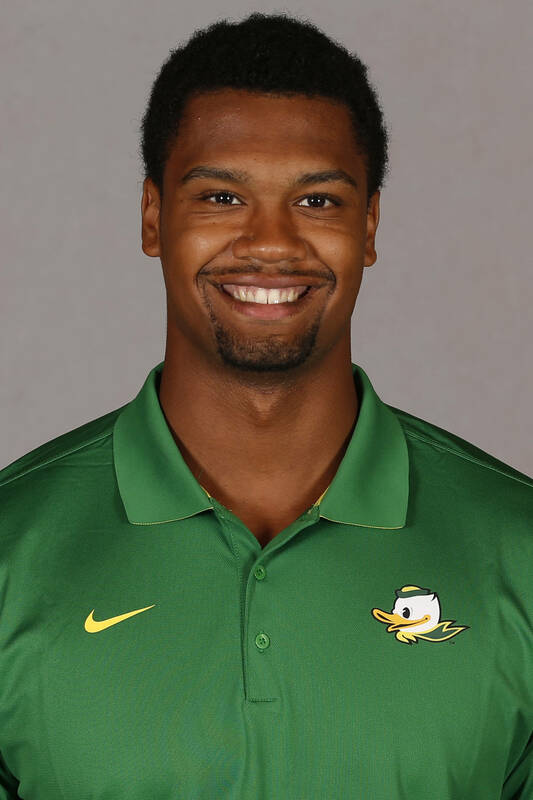 However no improvement was more evident than his prowess as a blocker, logging a career-high 101 snaps vs. California as the Ducks rushed for 477 of their school-record 777 yards of total offense. 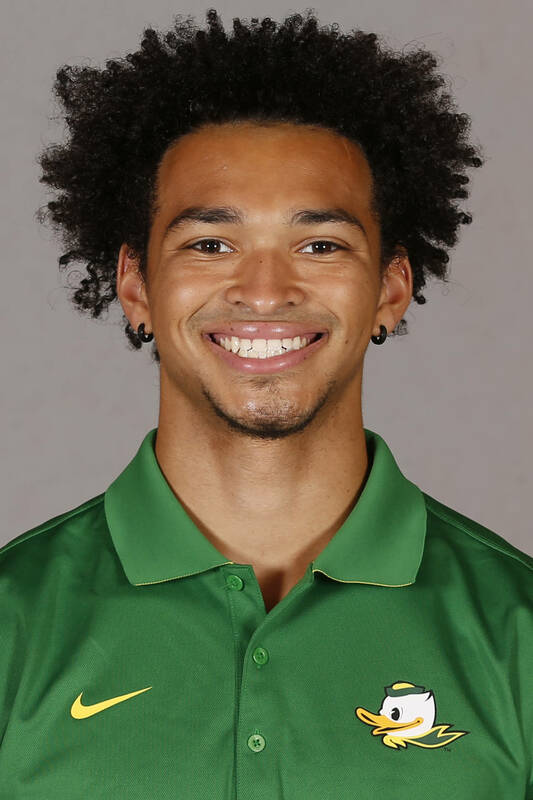 2014 — Oregon’s ninth-leading receiver stepped onto the field for the final 11 games, including starting roles in three of his final four outings ... Enhanced his skills at the point of attack as well as a receiver downfield as the season wore on, claiming his most extensive playing time of the year in his final three appearances of 2014 ... Logged 72 snaps in the national championship finale vs. Ohio State as well as 61 plays in the Pac-12 Championship win ... Caught 15 passes for 143 yards, including a 15-yard scoring catch against Colorado ... After being held without a catch until the seventh game of the year, he ended the season with a flurry as he accumulated 11 receptions for 98 yards in the final two games ... Latched onto six grabs for 98 yards over the course of the final two games, including six catches for 73 yards in the Rose Bowl win over Florida State. 2016 — Started at right guard in the 2016 season opener against UC Davis adding to his team-high 32 career starts. 2015 — Extended his string of consecutive starting assignments to 16 games at Michigan State while opening 21 of his previous 22 appearances ... 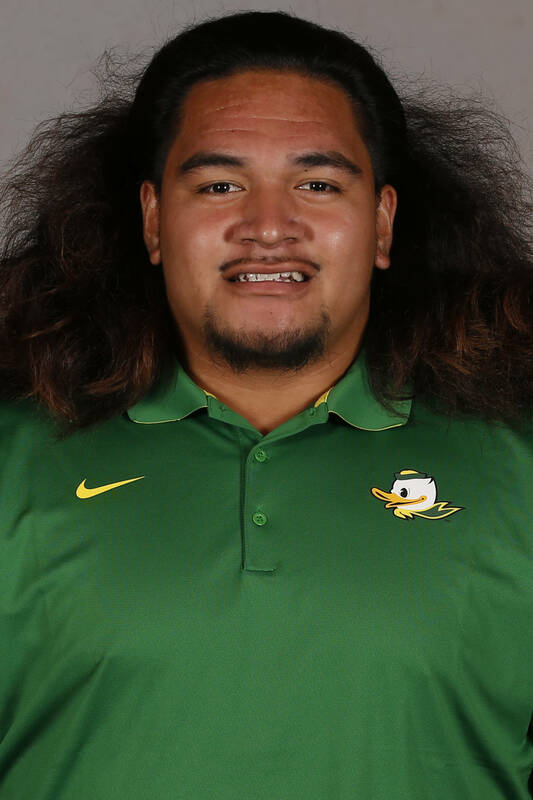 Missed his first game in three seasons with the Ducks when ailments did not allow his appearance against Georgia State ... But returned to start eight of the final 10 games at right guard as he stepped onto the field 12 times his junior year ... Maintains the versatility to play any of the five offensive line outposts ... His 87 snaps in post-season play vs. TCU represented the second-most plays among any of his offensive teammates, while he also accumulated more than 80 plays at Colorado and Washington ... Proved to be crucial to the team's success in accumulating a school-record 777 yards of total offense vs. California, as well as 61 points at Arizona State, 485 yards on the ground against Eastern Washington, and 407 passing yards over USC ... Also served as a vital cog for an offense that ranked fifth in the country in total offense, rushing, and scoring, in addition to his role in helping Oregon extend its hold on the league's rushing title for the 10th year in a row. 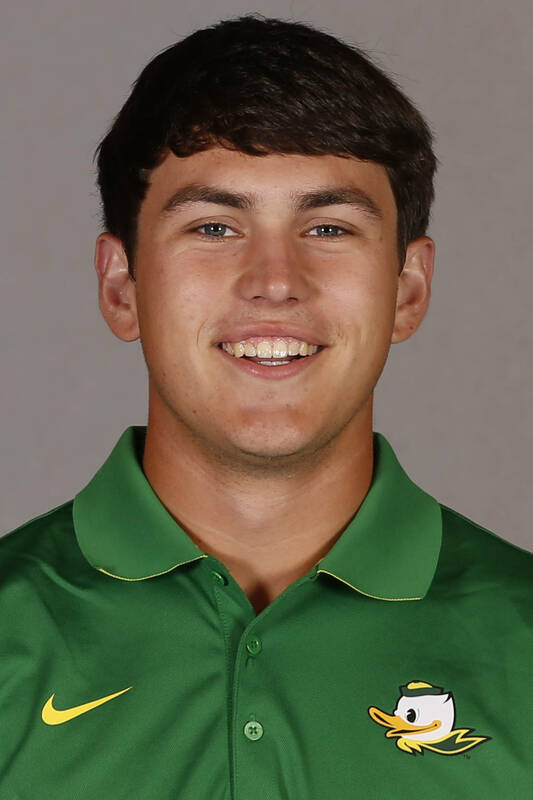 2015 — The Ducks enjoyed the luxury of being able to redshirt someone of his potential as the scout team served as a means to ease his transition to the next level ... Continued his progression during the spring of 2016 and added to his versatility by working out at center as well ... 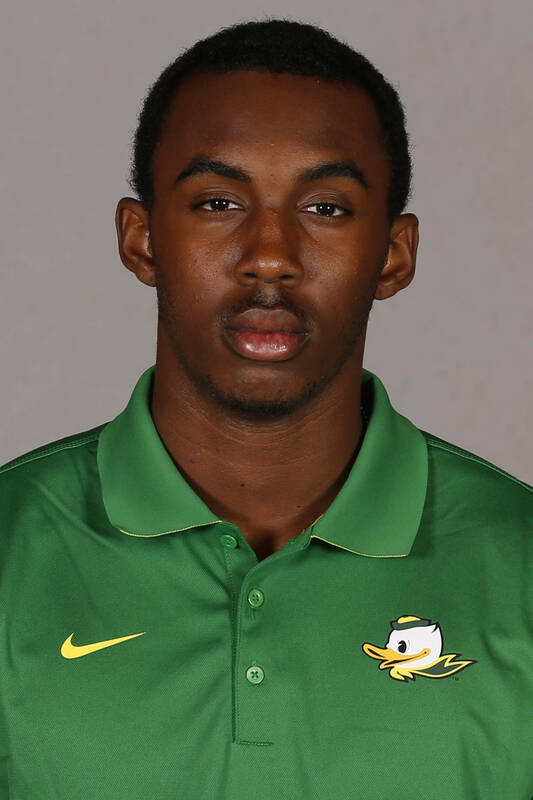 Joined the Ducks at the beginning of the 2015 winter quarter as a means to accelerate his grasp of the offense ... Took part in his second spring game in 2016. BEFORE OREGON — The MaxPreps Division III first-team all-state standout and 2015 PrepStar All-American was ranked among the top six players in the country at his position by Scout.com and among the best 35 overall prospects in the state by Rivals.com ... The U.S. Army All-American Bowl selection as well as Rivals250 and ESPN 300 choice was named to the All-Southern California first-team offense by Southern California Preps.com ... Also garnered all-area attention by the Los Angeles Times and L.A. Daily News, as well as the Ventura County Star offensive player of the year accolades and CIF Southern Section All-Northern Division acclaim for the Panthers, who finished 2014 with an 11-3 record ... The Camino League champions ranked fifth in the Southern Section Northern Division III under head coach Gary Fabricius, eclipsing 40 points in each of his team’s 11 wins ... Newbury Park averaged 183.4 yards per game on the ground while running for 32 touchdowns, in addition to throwing for a 264.8-yard average, while advancing the Northern Division championships. 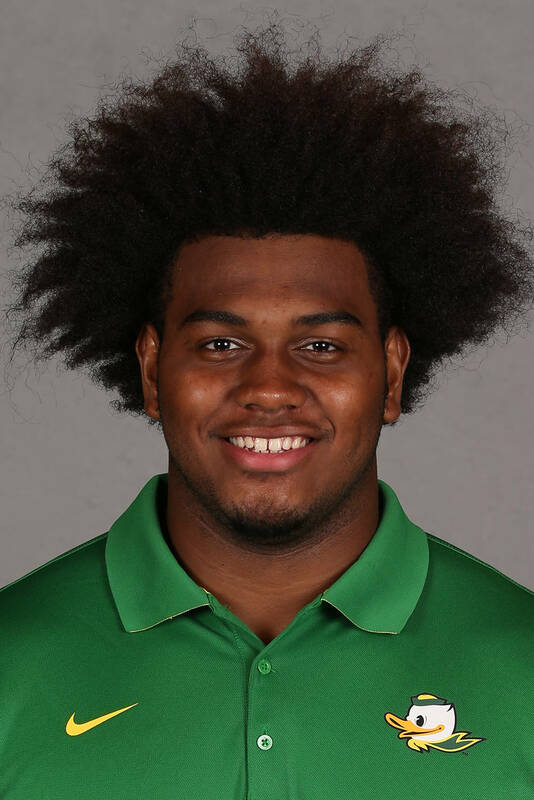 BEFORE OREGON — Ranked as the top prospect in the state by ESPN.com and Idaho’s best defensive lineman (Scout.com), he has been described as physical player who maintains good pad level while utilizing uncanny athleticism along with good use of his hands and upper body strength ... The two-time first-team all-Idaho selection (as chosen by the state’s high school coaches) as well as a second time all-area honoree (Idaho State Journal) finished his senior season with 44 tackles for the Rams, who advanced to the semifinals of the Idaho 5A state playoffs in 2015 and posted a 9-2 record ... Also accumulated 11 tackles for loss, five quarterback sacks and three forced fumbles a year ago for a team that ended the season ranked fourth in the state ... Tallied 49 tackles and four QB stops behind the line of scrimmage for the unbeaten 5A state champions as a junior while anchoring a defensive line that allowed only 12.9 points per game ... Singled out as the defensive line MVP at the All-Poly football camp during the summer prior to his high school senior season. 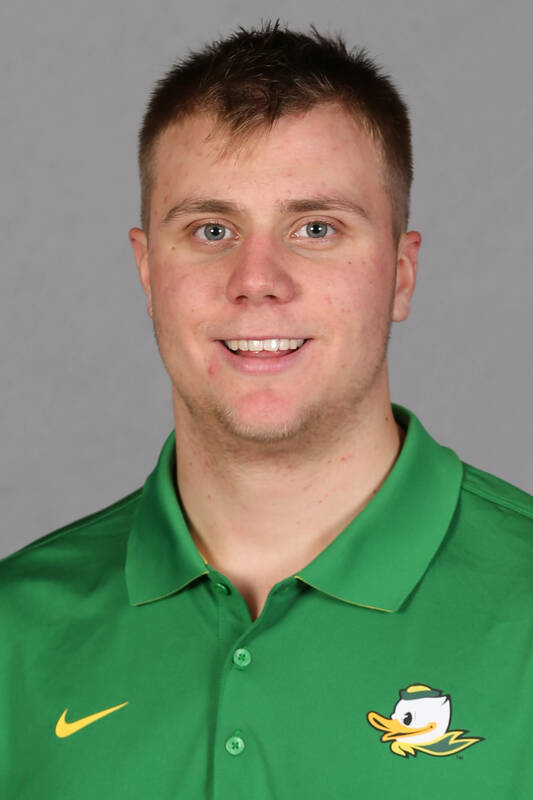 BEFORE OREGON — The graduate transfer was a two-year offensive line starter before earning his undergraduate degree in finance from the University of Dayton . . . Earned first-team all-Pioneer Football League accolades after opening all 12 games at left tackle his senior year for the Flyers, who finished the season with a 10-2 record and an opening-round loss in the Football Championship Subdivision playoffs . . . The three-time second-team academic all-conference honoree was the recipient of the school’s Outstanding Lineman Award following each of his last two seasons . . . Started all 11 games at right tackles as a junior for a squad that led the conference in rushing (195.5 avg.) and finished second in scoring (30.4 ppg) . . . The three-sport prep letterman earned first-team all-Chicago Catholic League acclaim his senior year for the Celtics in addition to claiming the conference’s heavyweight wrestling title in 2011. 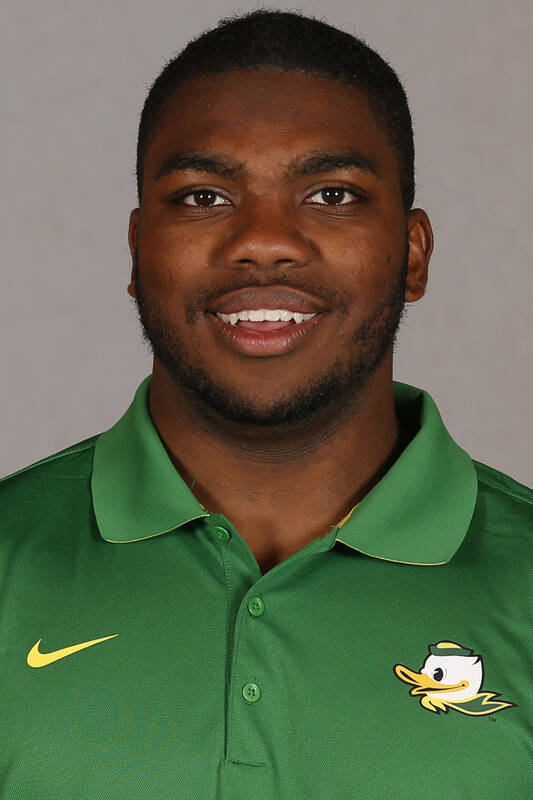 2016 — Participated in Oregon spring drills after graduating early from high school in order to enroll at Oregon in time for the start of the winter term. 2015 — Took full advantage of his redshirt year by getting bigger and stronger since his arrival while absorbing the lessons handed down from a veteran interior line . . . Continued his progression during the off-season to become the recipient of sufficient repetitions during the 2016 spring drills. BEFORE OREGON — The 2014 Seattle Times’ pre-season all-state choice earned PrepStar All-West Region acclaim following a senior season that earned him a spot in the 2015 Semper Fidelis All-American Bowl . . . Ranked as the top offensive guard in the state by Scout.com and ninth in the region at his position while the Rams finished 2014 with a 4-6 overall record . . . The two-way starter attracted the majority of his accolades on the offensive side of the ball, earning mention on the Tacoma News Tribune’s Northwest Nuggets ledger . . . The first-team All-Big 9 choice claimed honorable mention all-league attention along the offensive line as a junior for head coach Scott Ditter’s crew. 2015 — Redshirted his freshman season behind a veteran group of offensive line returnees. BEFORE OREGON — Afforded MaxPreps Division III first-team all-state honors as well as All-West Region attention by PrepStar following a senior season that saw the Dons post an 8-4 overall record under head coach Mike Ivankovich . . . Rated 11th at his position in the state while receiving All-Metro kudos from the San Francisco Chronicle as well as Contra Costa Times’ All-East Bay acclaim . . .Named North Coast Section and All-Diablo Foothill second team following his junior year . . . 2014 team averaged 34.3 points a game while advancing to the second round of the CIF North Coast Section playoffs. 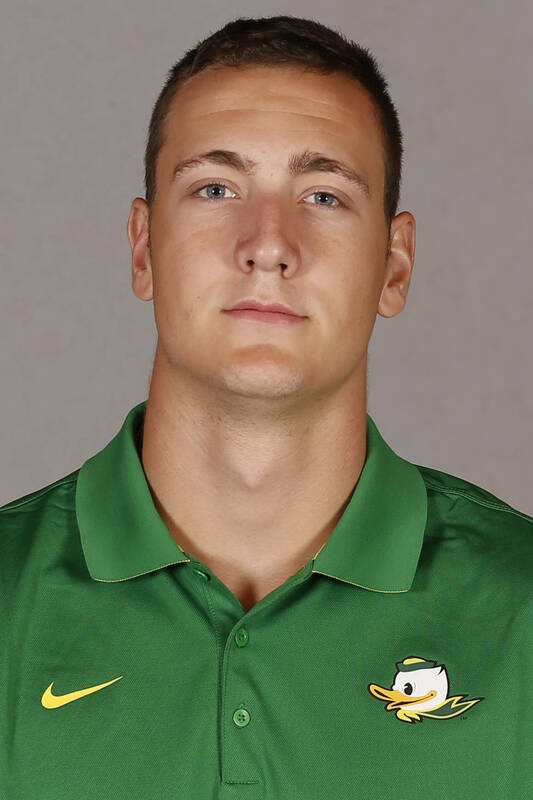 2016 — The walk-on was added to the Ducks’ roster prior to the start of spring drills, spending spring practices transitioning to the collegiate level. 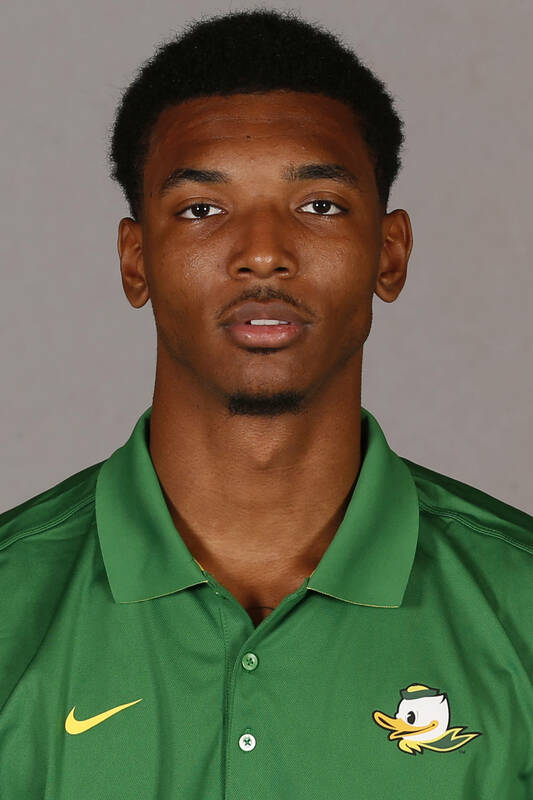 2015 — While the majority of his contributions continued to take place during the week as part of the team's scout team, he did make his collegiate debut with five plays against Georgia State. 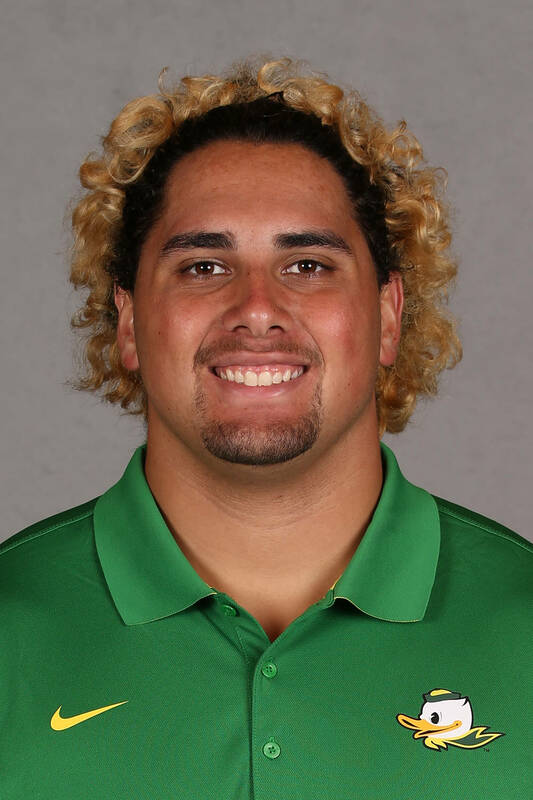 BEFORE OREGON — The first-team all-state offensive lineman was a three-year starter for head coach Kale Ane’s 2013 state champions who finished the year with an unblemished 11-0 record . . . The team captain started at guard as a junior before being shifted to left tackle prior to the start of his senior season . . . A mainstay for a contingent ranked 17th in the country at the end of 2013 and tallied 2,912 of its 4,852 total yards through the air while averaging 39.3 points per game . . . Reported to have benched 325 pounds and clocked 5.2 seconds over 40 yards his senior year. BEFORE OREGON — The PrepStar All-West Region choice was rated as the No. 3 defensive end in the state and fifth in the West at his position by Scout.com for the Bears, who finished his senior season with a 7-4 record after advancing to the quarterfinals of the Division I Central Section of the CIF state playoffs . . . Ranked 19th in the country as a weak-side linebacker (24/7Sports) and the 39th prospect in the state (ESPN.com) ... Tabbed for inclusion on the Fresno Bee’s Fab 50 Football All-Stars as well as the Scout 300 elite . . . Jumped out of the gate early, posting 12 tackles vs. Bullard in the second game of the season before posting two quarterback sacks vs. Clovis North in an outing where he was honored as Defensive Player of the Game vs. Clovis North (MaxPreps) on the second of two occasions. 2016 — Enrolled at Oregon for the start of the winter term in order to get a jump on off-season workouts and preparations for spring practice . . . Improved play as the spring wore on and provides the physical skills conducive to the program's revamped defensive philosophy . . . Contributed five tackles in the 2016 Spring Game. 2015 — Coaches resisted the temptation to insert him into the lineup as a true freshman and are expected to benefit from their discipline to utilize a redshirt year for years to come . . . Has demonstrated the maturity to become a fixture in the rotation at center with a solid spring showing and should head into his second fall with the opportunity to display his prowess on a full-time basis. BEFORE OREGON — Garnered MaxPreps Division II second-team all-state honors for a contingent that finished the year with a 4-6 record under head coach Jason White . . . Ranked as the No. 5 in-state product at his position by Scout.com as well as the nation’s 70th offensive tackle . . . Credited with 13 pancake blocks for a run-oriented offense that averaged 223.5 yards per game and scored 26 of its 34 touchdowns on the ground . . . Defensively, accumulated 61 career tackles (39 unassisted), including 29 total stops (20 solo) his senior season . . . The Big 5 League’s two-time co-MVP lineman and 2014 team captain posted a single-game best of seven tackles vs. Fortuna, with the Loggers’ two-way starter also serving as the team’s long snapper . . . His grandfather played in the NFL for the Los Angeles Rams. 2015 — One of a handful of young offensive linemen who redshirted their freshmen seasons attracted attention in the spring and could make inroads in the rotation during the coming fall . . . Benefitted from others' health misfortunes during the 2016 spring workouts to take advantage of additional repetitions with the first and second units at tackle, with his physical attributes allowing him to remain in the mix when the lights come on . . . Played extensively during his first Spring Game. BEFORE OREGON — The four-year defensive line starter as well as two-time KingCo 4A Lineman of the Year and first-team all-league pick was included among the Tacoma News Tribune’s 2015 Northwest Nuggets honor roll and PrepStar All-West Region elite . . . Ranked by Scout.com as the state’s 11th overall in-state recruit and Washington’s No. 3 offensive tackle while Rivals.com projected him among the nation’s top-50 at his position . . . Was selected to the Associated Press 2014 4A all-state first team and all-area by the Seattle Times . . . Credited with 13 pancake blocks his senior year in addition to 61 tackles (28 unassisted) and nine tackles for loss . . . Included was a season-best nine tackles against Olympia for a team that recorded a 10-3 mark and advanced to the 4A state semifinals under head coach Drew Oliver . . . Posted 46 tackles (39 solo) and recovered two fumbles as a junior for the Knights after contributing 33 tackles and three forced fumbles during the 2012 campaign. 2016 — The walk-on was added to the roster in time for the start of spring drills, where he worked to grab the coaches' attention . . . Credited with three tackles in the annual Spring Game. 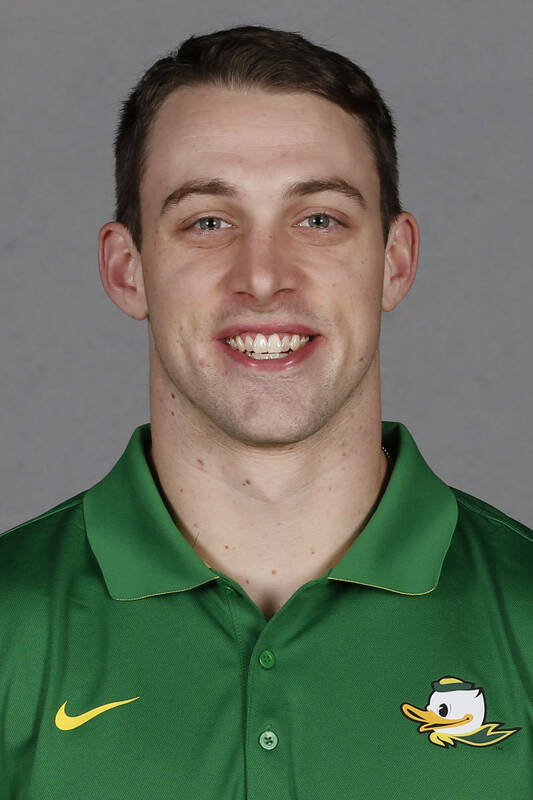 2015 — Special teams paved the way for much of the walk-on transfer's early indoctrination into the Pac-12 before gradually expanding his role late in the year . . . Credited with playing in nine games during first season with the Ducks after joining the team at the beginning of the 2015 spring term . . . Completed the year recording three tackles (2 unassisted), including single tallies vs. Eastern Washington, Stanford and Oregon State . . . Logged 15 snaps in the regular-season finale against the Beavers, along with 12 plays against Eastern Washington and 10 vs. California . . . 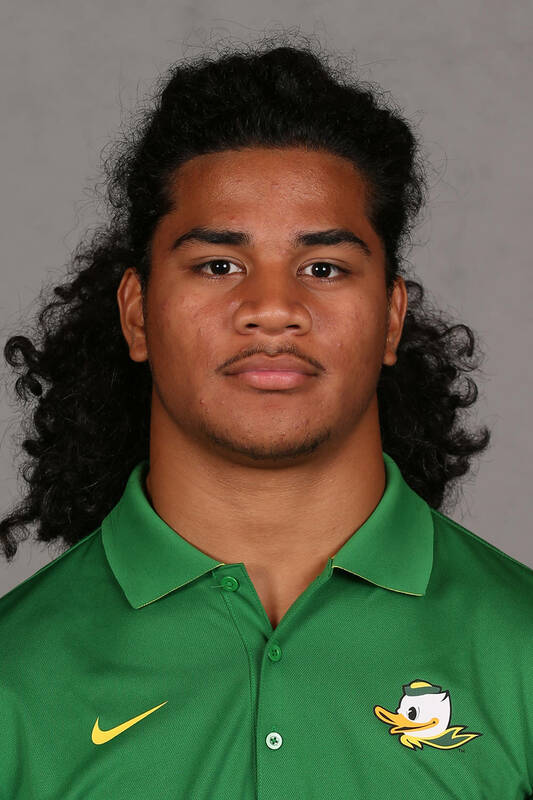 Proved to be one of Oregon's major surprises of the 2016 spring to loom as a possibility of breaking his way into the team's rotation at linebacker should his progress and work ethic continue to spiral upwards . . . Contributed three tackles (2 unassisted) in the Spring Game before being awarded a scholarship at the conclusion of spring drills. 2015 — Continued to benefit from the experience handed down from a veteran corps of defensive line upperclassmen that should translate into him filling their shoes in the future . . . Played in all 13 games, including a season-high 23 snaps at Arizona State . . . Finished the year with six tackles, including a pair of tackles in back-to-back appearances vs. Georgia State and Utah . . . Also was credited with a tackle for loss in a win against the Panthers . . . Added tackles vs. Stanford and TCU in the Alamo Bowl . . . The academic all-conference honorable mention selection earned significant repetitions during 2016 spring drills while posting two quarterback sacks among his three tackles in the Spring Game. 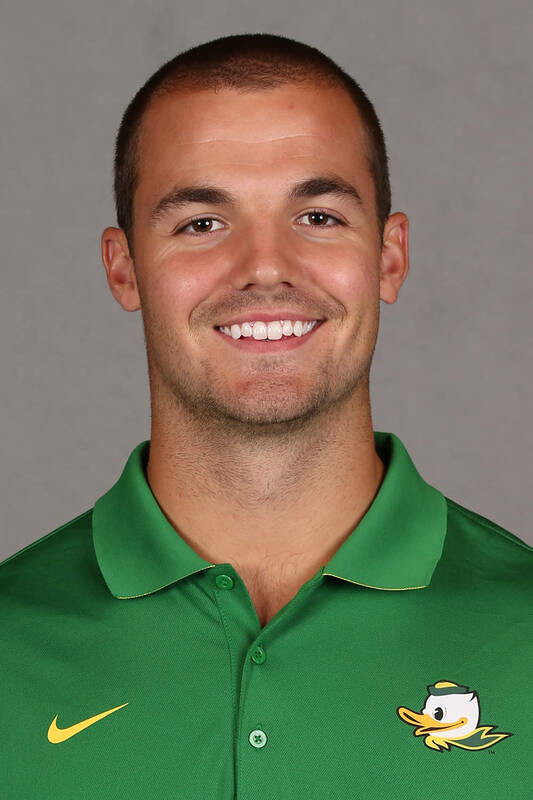 2015 — Exclusively handled all 98 of the Ducks' kickoff responsibilities, averaging 63.8-yards per kick and sending 37 percent of his boots (62) into the end zone for touchbacks . . . 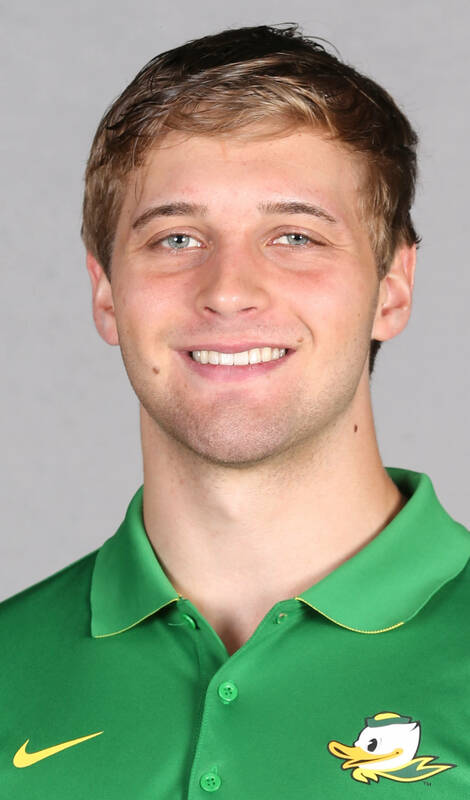 Drove all six kicks into the end zone for touchbacks in the Alamo Bowl vs. TCU, seven of his eight kickoffs for touchbacks at Colorado, and five-of-six boots beyond the goal line against Washington State . . . Shared the Ducks' special teams player-of-the-week honors in the week leading up to the Georgia State game in addition to earning the team's weekly special teams accolades for performances vs. Colorado and Stanford . 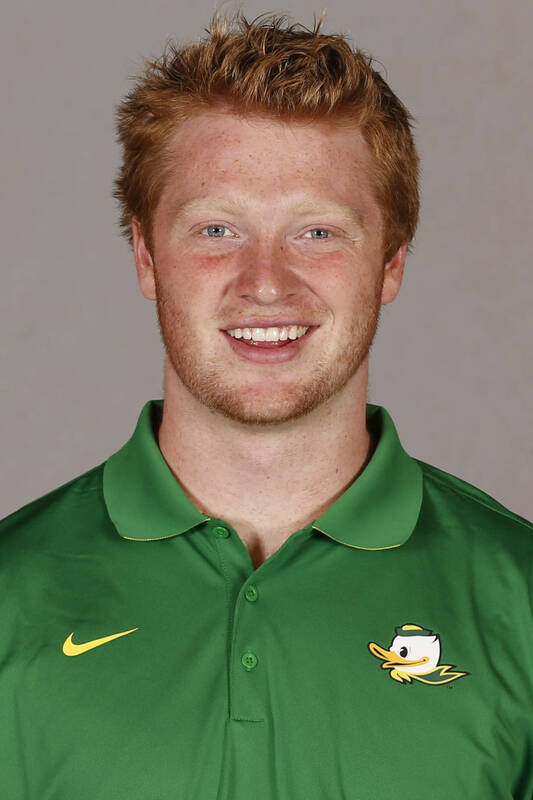 . . Made his collegiate debut as a punter in the win over Oregon State, accumulating 38 yards in his lone attempt . . . Following the year was afforded academic all-conference honorable mention acclaim for the second year in a row. 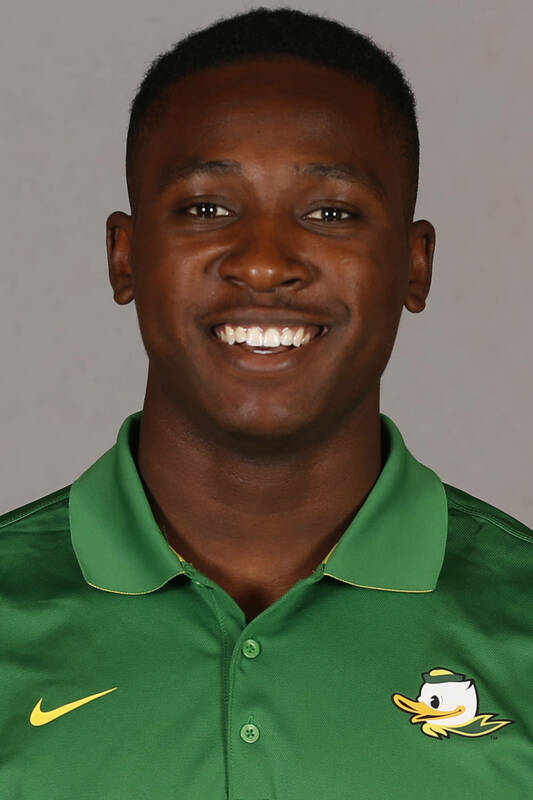 2015 — Came off the bench in 12 games to post six tackles as a true freshman, including a single-game best two assists in his collegiate debut against Eastern Washington . . . Added single stops in appearances against Colorado, California, Stanford and TCU . . . Logged a season-high 20 snaps in a hard-fought defensive effort vs. the Cardinal and 18 plays against Georgia State . . . Attracted considerable attention during off-season workouts that could thrust him into the regular rotation during the upcoming campaign, recording four tackles in the 2016 Spring Game. 2015 — Developed into one of the program's top linebackers off the bench, finishing the year with 12 of his 25 tackles unassisted . . . Broke into the starting lineup against Oregon State while appearing in all 13 games, taking part in a collegiate-high 50 snaps against the Beavers when he was credited with a career-best seven tackles (4 solo) . . . Also contributed four stops on consecutive weekends vs. Utah and Colorado, as well as at Stanford . . . Added a forced fumble in Boulder, Colo., as he was credited with tackles in nine of his appearances . . . Exhibited an outstanding work ethic during 2016 off-season workouts to position himself in the center of contention for more playing time in the fall . . . Recorded four assisted tackles in the latest Spring Game. 2016 — Graduated from high school early in order to enroll at Oregon in time for the start of the winter term and participate in spring drills. BEFORE OREGON — Recognized among the nation’s top prep prospects as indicated by the inclusion on the Scout 300 listing after tallying 71 tackles (43 unassisted) and three quarterback sacks in 2015 . . . The PrepStar All-American was selected to play in the Semper Fidelis All-American game, but opted to enroll at Oregon for the start of the winter term instead . . . Ranked 37th in the country at his position by Rivals.com and the No. 5 outside linebacker in California by Scout.com, the Vikings’ fifth-leading defender posted a single-game high 15 tackles, including two QB takedowns, in the win over Paramount after coming up with 13 stops (11 solo) vs. Warren . . . The Long Beach Press-Telegram All-Area Dream Team honoree also was utilized as a receiver throughout his high school tenure, accumulating 40 catches for 580 yards and five touchdowns while enjoying his greatest offensive success his sophomore and junior seasons . . . Registered 41 of his 88 tackles unassisted as a junior while posting eight quarterback sacks, two caused fumbles, and one interception . . . Included were 14 tackles and four TFLs in the second game in 2014 vs. Vista Murrieta and 13 stops in the CIF Southeast Division of the Southern Section championship game against Crescenta Valley. BEFORE OREGON — Played senior season at Mission Viejo High School in 2015, excelling both on defense on the football field and on the track ... Earned first-team California Large School all-state, first-team all-Orange County (Orange County Register) and first-team all-league honors on the gridiron and was named the CIF Southern Section West Valley defensive MVP after recording 91 tackles and three interceptions as a defensive back ... Also accumulated a trio of blocked punts and two deflected field goals for the Diablos ... On the track, placed 11th in state in the long jump as a senior in only his first year in addition to posting a season-best 23-4.25 ... Transferred to Mission Viejo HS following his junior season at Trabuco Hills in Mission Viejo ... Earned first-team all-Sea View League and all-CIF honors as a junior, leading the team with six interceptions while also hauling in 25 receptions for 478 yards at receiver ... Spent his sophomore season at Dana Hills High. 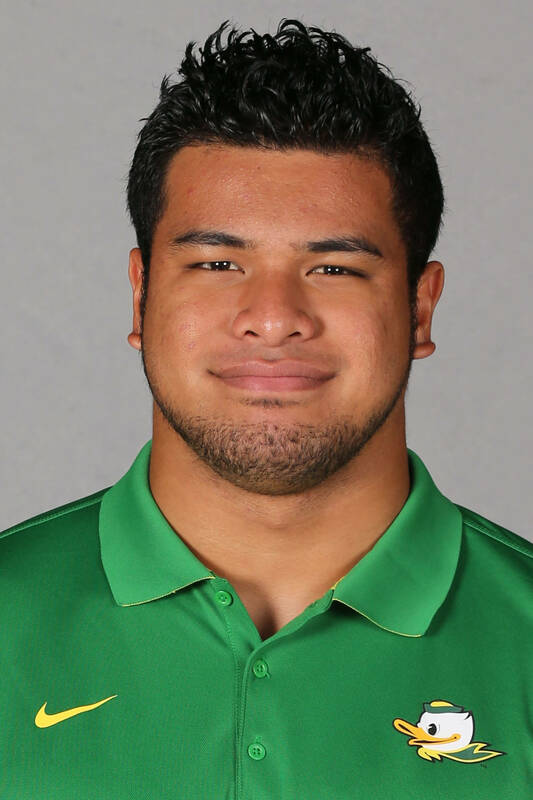 2015 — Stepped onto the field for six games his junior year, posting an unassisted tackle vs. Georgia State in his most extensive action of the year (14 snaps) . . . Was shifted from outside linebacker to defensive end in the 2016 spring with the team's transformation to a 4-3 defense. 2014 — Injuries helped limit his playing time as he logged snaps against South Dakota, Wyoming and UCLA . . . Posted one tackle in his most extensive action of the year vs. the Cowboys (21 plays). 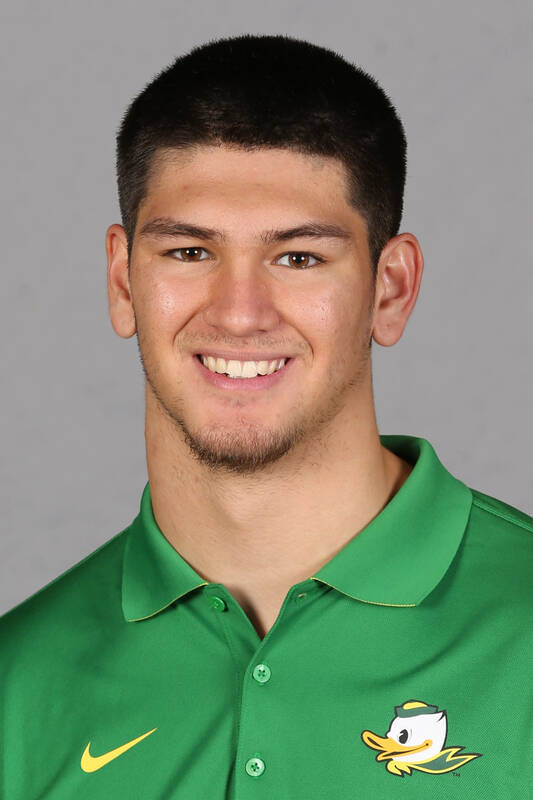 BEFORE OREGON — Originally regarded as a basketball player before transferring from Jesuit High School for his senior season . . . Became a two-way starter at Tigard as a senior after not playing football during sophomore and junior seasons . . . Finished the season as school’s third-leading receiver after hauling in 24 passes for 502 yards and six touchdowns . . . Caught three passes for 76 yards and two touchdowns against Canby … Exploded for five catches for a season-high 134 yards and a score against Tualatin . . . As a defensive end, racked up 45 tackles, including 23 solo . . . Led the team with 12 tackles for loss and 7.5 quarterback sacks. 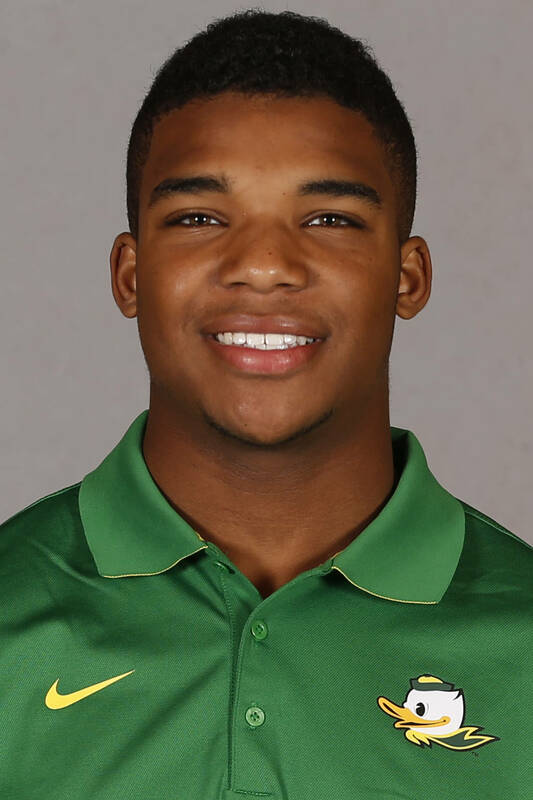 2015 — Continued to make the necessary sacrifices for the Ducks by making his biggest contributions during the week at practice to help teammates prepare for their opponents as a scout team mainstay . 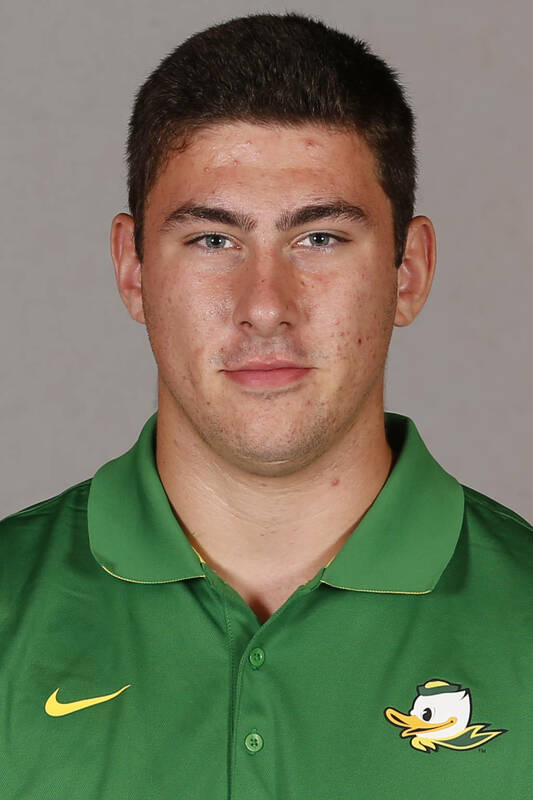 . . Was singled out as the scout team’s offensive player of the week in aiding preparations for the Ducks’ season opener vs. Eastern Washington . . . Made his lone collegiate appearance the third week of the season vs. Georgia State . . . 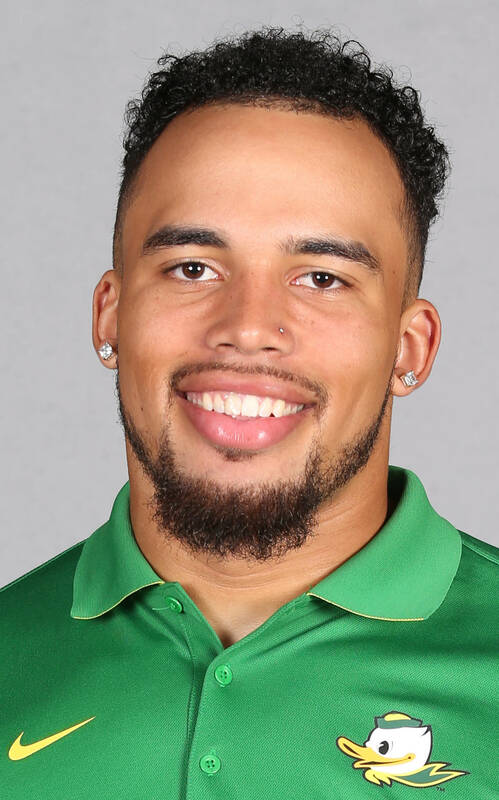 Finished the 2016 Spring Game as Oregon's third-leading rusher, accumulating 37 yards on eight carries, in addition to catching four passes for 30 yards. BEFORE OREGON — Competed in rack & field at College of the Siskiyous . . . Was ranked No. 3 in Nor Cal in the javelin in 2013 . . . Earned scholar-athlete and President’s List honors in 2013 . . . Recorded 196 yards for a 24.5 ypg average as a senior at West Albany in 2011 . . . Also played linebacker . . . Named most outstanding offensive back and most inspirational by the team while at West Albany High School. 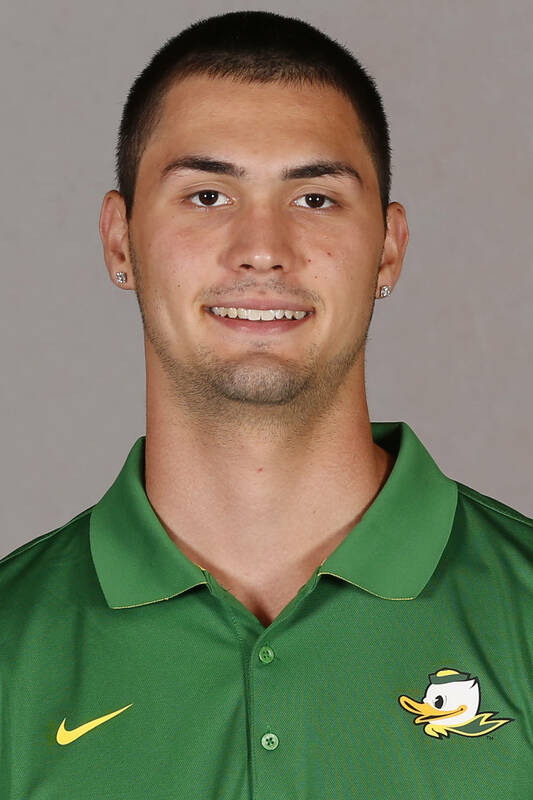 2015 — The walk-on was added to the roster after the start of fall classes and contributed as a member of the Ducks’ scout team. 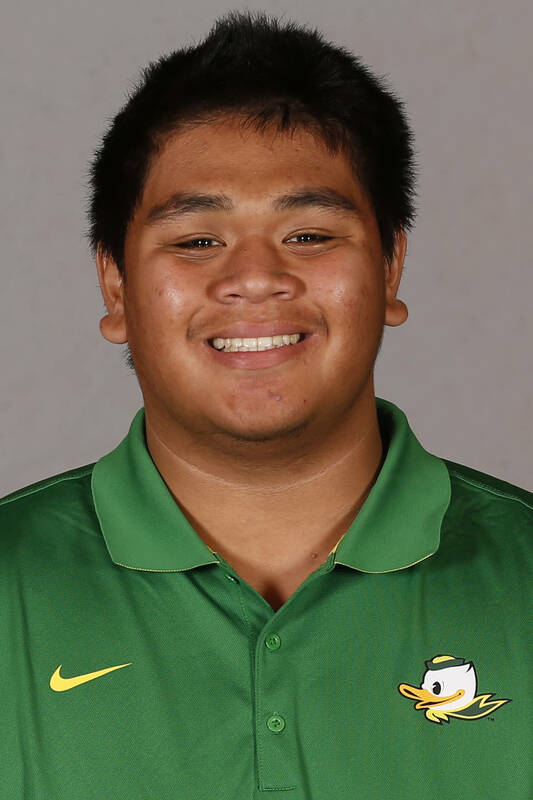 BEFORE OREGON — Helped lead Mililani High School to back-to-back state championship game appearances in 2013 and 2014, including an unblemished 13-0 record and a 53-45 win over Punahou in the Division I state championship game his senior year . . . Recorded a season-high four solo tackles in winning the state title . . . Played strong safety, free safety and outside linebacker while at Mililani. 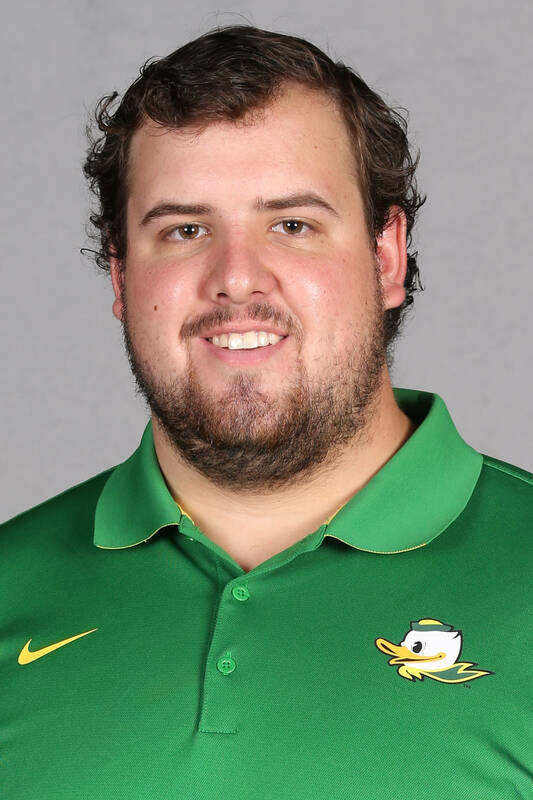 2015 — Continued to be a mainstay on the Ducks' scout team, enhancing the team's preparations for Saturdays on a weekly basis despite being unable to work his way into the lineup on game day . . . Was named the school’s scout team special teams player of the week for aiding preparations heading into the season-opening win over Eastern Washington . . . Contributed an unassisted stop in the 2016 Spring Game. 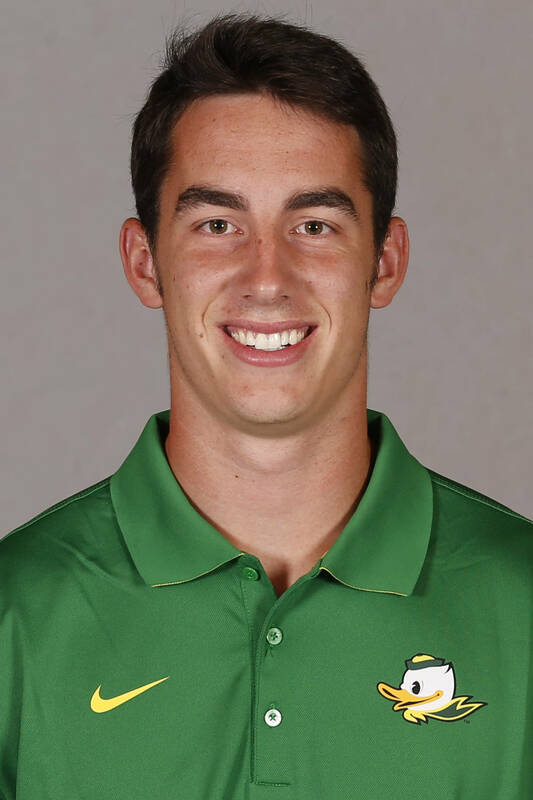 2015 — Served as the Ducks' primary punter in 10 of 12 regular-season opportunities before booting the ball six times in the Alamo Bowl for a 37.8-yard average . . . Included were a pair of kicks inside the 20-yard line and only two returns for 11 yards . . . After not attempting any kicks in the season opener he encountered a span of averaging 40 yards or better in four outings in a six-game span . . . His 45.3-yard average at Arizona State included a career-long 56-yard launch - one of four kicks of 50 yards or better . 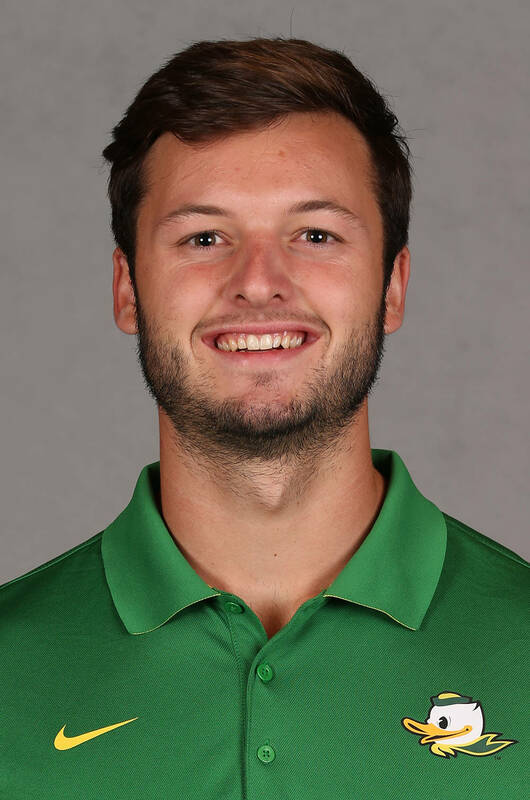 . . Also punted five times at Washington for a single-game best 45.6-yard average that included a trio of kicks that rested inside the 20-yard line and only one return of 3 yards . . . Finished the season punting the football 50 times for a 39.8-yard average, forcing 15 fair catches, placing 13 balls inside the 20 yard line and two touchbacks . 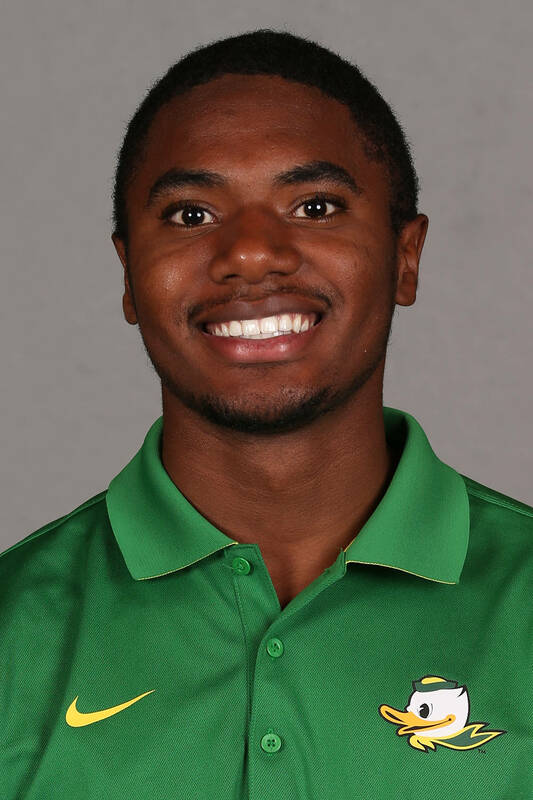 . . Was credited with tackles in consecutive appearances against California (1 solo) and Stanford (1 assist). 2016 — Graduated from high school early in order to enroll at Oregon for the spring term and participate in off-season workouts . . . Was credited with five tackles (3 unassisted) in the Spring Game while sharing a quarterback sack for a 4-yard loss. BEFORE OREGON — Ranked as the No. 4 recruit in the state, the PrepStar all-West Region choice was credited with 101 tackles, five quarterback sacks, and a pair of forced fumbles in nine games his senior year for a team that finished with a 7-4 record . . . The first-team all-state linebacker (Associated Press) also added 13 receptions for 209 yards and two touchdowns on the other side of the football for the Pirates, who advanced to the opening round of the state’s 4A playoffs for the second year in a row . . . Garnered first-team all-state acclaim as a tight end his junior year while catching 26 passes for 380 yards and four touchdowns, and contributed 62 tackles, two interceptions and one fumble recovery as a linebacker/safety...Achieved most of his recognition as a tight end early in his prep career, claiming second-team all-Big 9 Conference honors as a freshman and second-team all-state plaudits the following year when he grabbed 32 catches for 393 yards and six scores in 2013 . . . Offered a glimpse of his future on defense with 50 tackles and two forced fumbles his sophomore season. 2016 — Graduated from high school early in order to enroll at Oregon in time for the start of the winter term and participate in spring drills . . . Contributed three assisted tackles in the Spring Game in addition to breaking up one pass . . . Pac-12 Player of the Week after his debut game against UC Davis finishing with a game high of 11 tackles, 4.5 tackles for loss and a sack. . . First true freshman to record double digit tackles in his career game since 1996 . . . First true freshman to start at linebacker in over 38 years. BEFORE OREGON — Considered to be the No. 4-ranked athlete in the country by 247Sports and the seventh-rated dual-threat quarterback in the nation by ESPN.com . . . Presents the combination of size, athleticism, and agility, along with a strong arm that warranted his inclusion among the PrepStar Top 150 Dream Team and ESPN 300 ledgers . . . The quarterback threw for 2,167 yards and 12 touchdowns his senior year while adding 1,478 yards and 16 scores on the ground for the Eagles, who dropped a one-point decision in the second round of the UIL Texas 6A D1 state playoffs . . . Surpassed the century mark in rushing yards in nine of 12 games, including a season-high 193 yards vs. Midlothian, and passed for 479 yards and three scores in the season-opening win against Martin . . . Was selected to play on the U.S. Under-19 National Team in the 2016 International Bowl . . . Was sidelined after two games of the regular season his junior year due to injury after rushing for 217 yards and three touchdowns in addition to passing for 287 yards and another four scores in the season-opening win . . . Returned for the two state playoff outings at the end of the year, running for 180 yards and three TDs in his first appearance following an eight-game absence . . . Ended his abbreviated 2014 campaign tallying 1,176 yards of total offense and 14 touchdowns. BEFORE OREGON — Included on the Rivals250 listing, the nation’s 11th-ranked athlete (Rivals.com) and PrepStar All-American has flourished as one of the most versatile athletes in the state for the 2014 OSAA state 6A champions . . . Rated as the state’s No. 2 prospect (Scout.com), the U.S. Army All-American was selected to play for the U.S. Under-19 National Team in last month’s 2016 International Bowl that defeated Canada, 33-0 . . . Tabbed as the No. 18 outside linebacker recruit in the country according to 247Sports, he accumulated 42 tackles (20 unassisted) his senior year, including 5.5 tackles for loss and five quarterback sacks, in addition to recovering two fumbles and forcing one other . . . Offensively he caught 25 passes for 462 yards and four scores for the Rams, who finished with an 8-3 record in 2015 after advancing to the state high school championship quarterfinals . 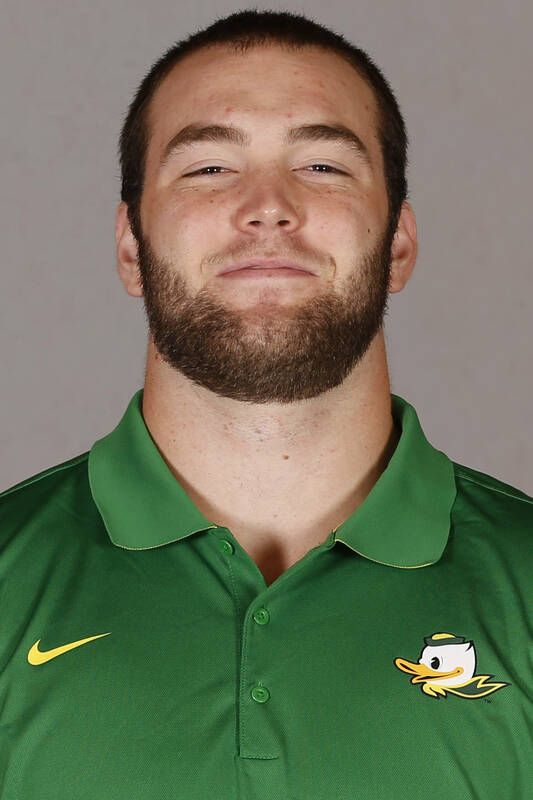 . . Earned second-team all-state honors (The Oregonian) his final season at linebacker after claiming the same accolades as a wide receiver at the conclusion of the 2014 campaign . . . Initiated his high school career at linebacker where he was credited with 43 tackles and an interception as a sophomore before transitioning to receiver his junior year, grabbing 22 passes for 546 yards and seven touchdowns. 2015 — Although he didn't make a huge statistical impact, his play and opportunities certainly intensified the second half of the season . . . While he stepped onto the field for 11 of 13 games - missing back-to-back outings against Washington State and Washington - his increased presence from the line of scrimmage coincided, in part, with the season-ending injuries suffered by others on the depth chart . . . Was credited with four of his five tackles in the final six games, including unassisted stops vs. Utah, Arizona State, and USC . . . Stepped onto the field for 28 snaps on the road against the Sun Devils and Stanford, and 27 vs. the Trojans . . . Was shifted from outside linebacker to defensive end prior to the 2016 spring workouts in the program’s transformation to a 4-3 defense . . . Included a quarterback sack among his two tackles in the 2016 Spring Game. 2015 — Came within 15 yards of matching his freshman season total with 83 yards on the ground in the season opener against Eastern Washington . . . Returned nine weeks later to surpass his previous collegiate best with 94 yards on eight carries in the win over California . . . 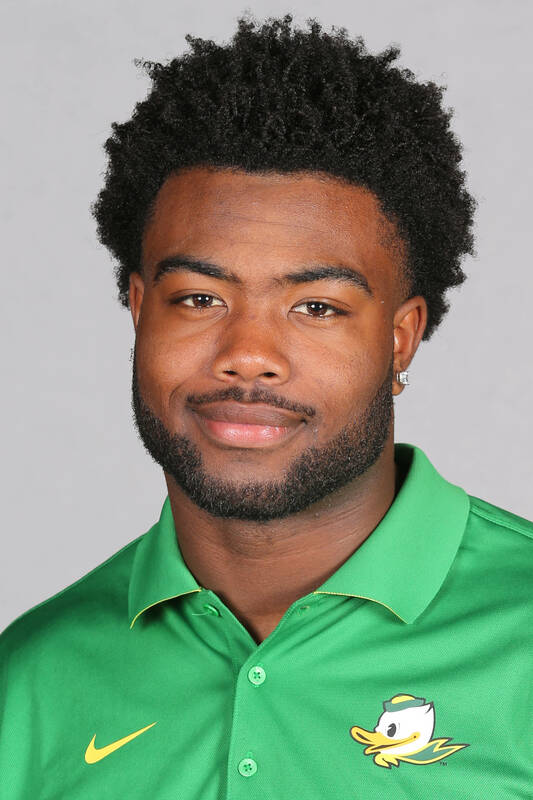 Accumulating yards on the ground in each of his 11 appearances, opened the Ducks’ scoring in his sophomore season debut with an 8-yard TD against the Eagles . . . Following the season was the recipient of the Dudley Clarke Award as team's most improved player . . . Combined the power to bull his way between the tackles and the speed to elude the pursuit once he cleared the line of scrimmage, the team's third-leading rusher completed the year running for 364 yards and added touchdown runs at Arizona State (62 yards) and Stanford (2 yards) . . . Also nabbed two receptions for 49 yards, including a 30-yard scoring catch in the win over USC . . . Took part in a career-high 18 plays vs. Eastern Washington and accumulated double-figure snaps on five other occasions . . . Led all rushers with 104 yards (and 1 TD) in the 2016 Spring Game. 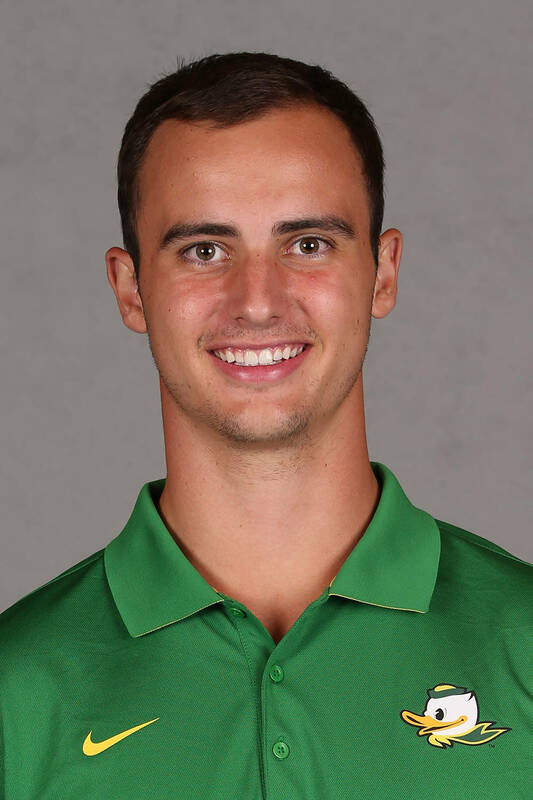 2015 — Emerged as one of the Ducks' top reserves at his position and made solid strides in the off-season to enhance his future impact . . . Finished the year with 20 stops (13 unassisted) in 12 appearances, including one TFL and a pair of defended passes . . . The Pac-12's first-team academic all-conference honoree (3.63 GPA in general social science) contributed tackles on 11 occasions, including equaling his career high with three takedowns against Georgia State, Washington State and California . . . Was on the field for 54 plays vs. the Panthers and took 46 snaps against the Cougars . 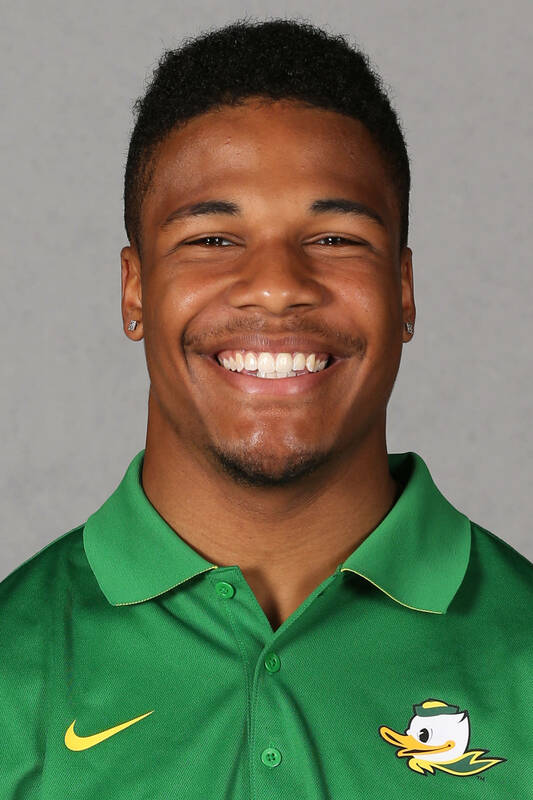 . . Exemplified traits as one of the defense's emerging leaders in the spring as he returns as Oregon's most experienced linebacker. BEFORE OREGON — One of the most decorated football players ever to be produced by the school, the PrepStar all-East Region standout was rated as the state’s No. 8 prep prospect (Rivals.com) as well as the third-best outside linebacker in the East Region (Scout.com) . . . Included on the Scout 300 listing, the Bears’ team captain was credited with eight blocked kicks during a five-week span early in his senior season . . . Also considered as the No. 20 outside linebacker in the country by Rivals.com. 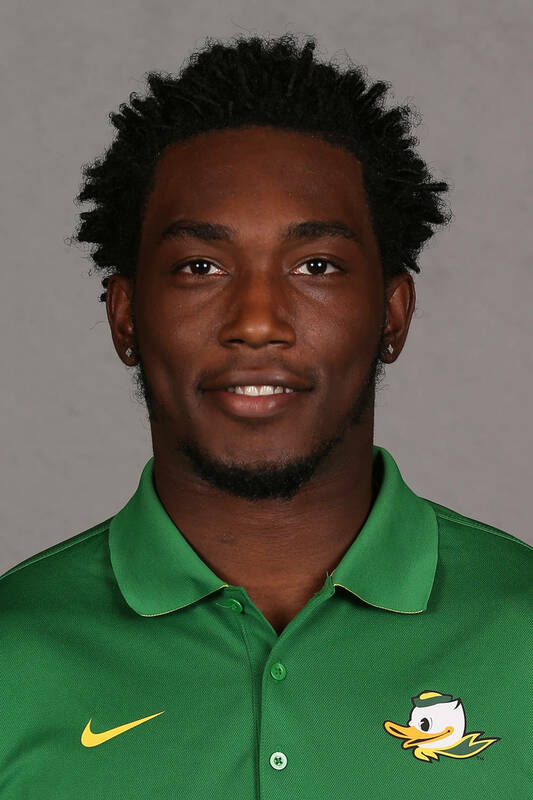 2015 — Experienced his first game action as a collegian with three snaps against Georgia State. 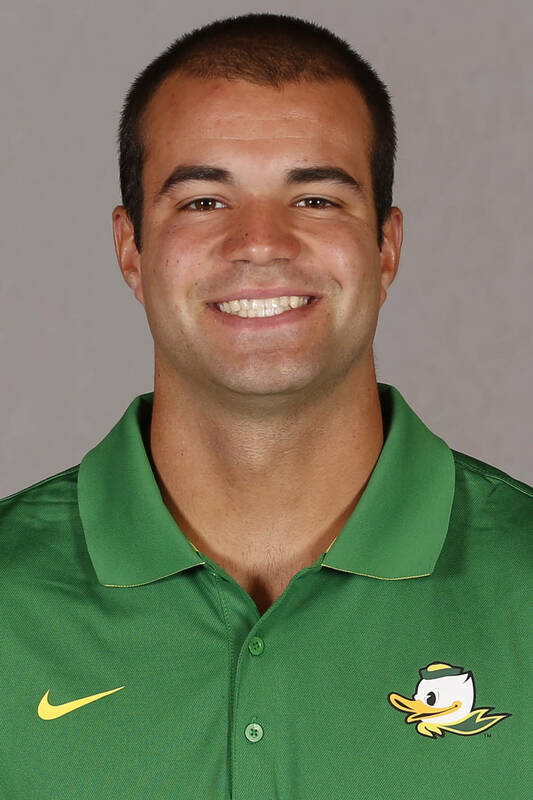 2014 — The walk-on joined the program for the start of fall camp and aided to the Ducks’ weekly preparations as a scout-team contributor. BEFORE OREGON — The 2013 Class 6A second team all-state selection collected 48 receptions for 624 yards (13.0 avg.) as a senior at Sunset High School along with five touchdowns catches . . . Recorded a season-high 134 yards on seven receptions in a 33-30 win over Grant . . . Was named Beaverton Leader's Male Athlete-of-the-Year after leading the Metro League in catches ... He also was named all-conference in basketball and lacrosse, leading the basketball team to the Class 6A state tournament in 2013 and 2014 while helping the Apollos' lacrosse team make the state playoffs. 2015 — The walk-on redshirted his initial collegiate campaign to enhance his transition to the next level . . . Was credited with a pair of unassisted tackles in the 2016 Spring Game. BEFORE OREGON — The four-year quarterback letterman captained the Rams to a 2-6 mark his senior year, running for nine touchdowns and throwing for eight others . . . Included were 170 and 162 yards on the ground in consecutive outings vs. Kents Hill and Hebron Academy, respectively, as he accounted for a trio of scores on three occasions . . . He added an interception to his two TD throws and one on the ground in a win over Phillips Exeter. 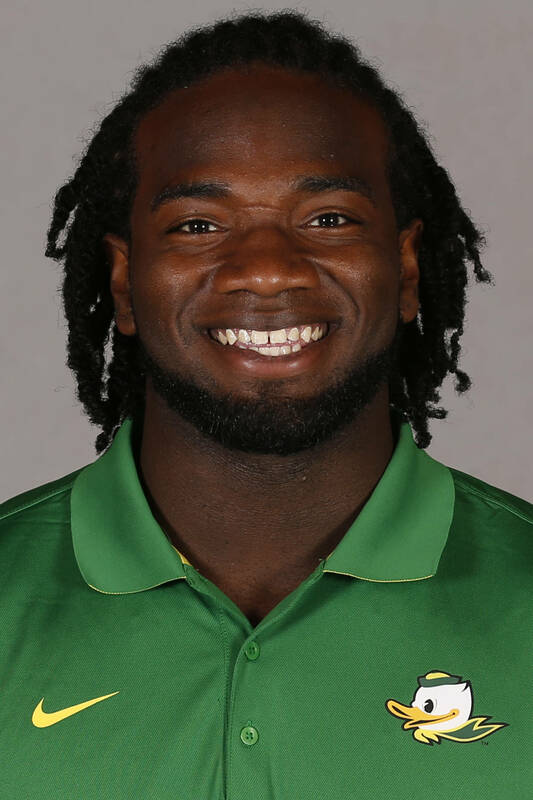 2015 — Contributed to the program's unprecedented depth at the position as Oregon's fourth-leading rusher led all running backs with a 9.0 yards-per-carry average . . . Provided the speed to outrun the opposition and get to the corner, accumulating 288 yards and three touchdowns on the ground as a redshirt freshman in addition to catching five passes for another 20 yards . . . Came off the bench to run for 63 yards and two touchdowns in his collegiate debut vs. Eastern Washington - averaging 10.5 yards per carry - before rushing for a personal-best 101 yards on seven attempts vs. California . . . Scored on carries of 12 and 15 yards while adding two receptions for 3 yards in the season opener before adding a 5-yard TD run in the Alamo Bowl against TCU . . . Added 50 rushing yards against both Georgia State and the Horned Frogs . . . Making appearances in 10 of 13 games, served as his team's second-leading rusher on three occasions . . . 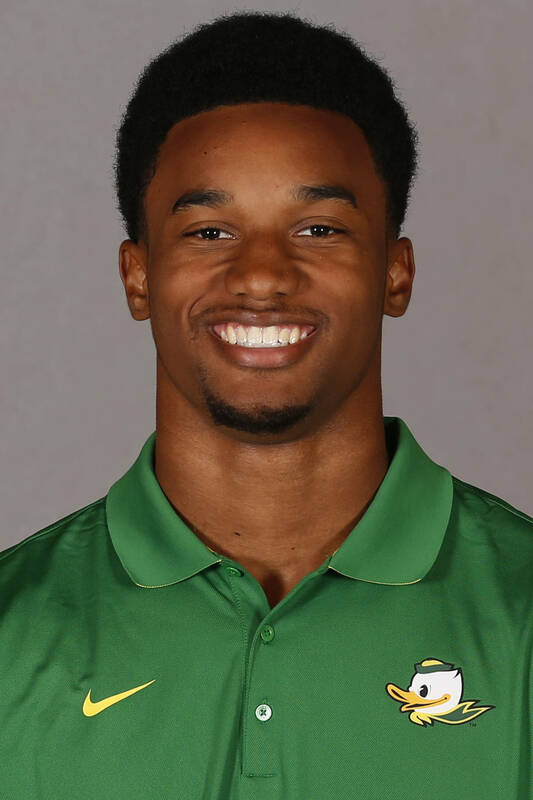 Expanded his role in the 2016 spring workouts as Ducks experimented with him as a slot receiver to maximize efforts to get him more playing time . . . Yet rushed for 75 yards and a 6.2 yards-per-carry average in his most recent Spring Game outing. 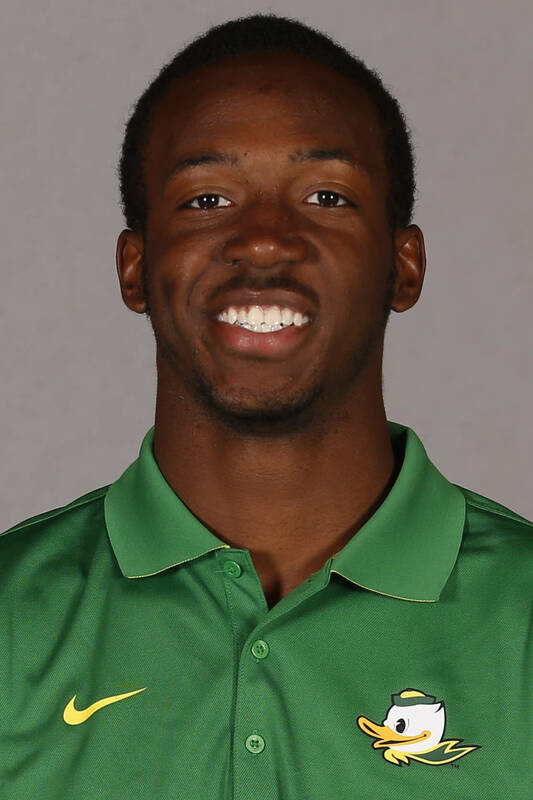 2015 — The true freshman excelled as a special teams standout from the outset, drawing double-team blockers from the opposition on a regular basis . . . Made appearances in 12 of 13 games while recording all seven tackles (3 unassisted) covering kickoffs . . . After posting his initial collegiate takedown at Michigan State, he was credited with a season-high three tackles in the win over USC . . . Also tallied stops vs. Washington, California, and Oregon State . . . Posted his most extensive action vs. Georgia State, logging 11 plays . . . Shifted from linebacker to safety in the 2016 spring, where his reputation as an aggressive competitor could become an asset as he earned more repetitions from scrimmage as the spring wore on . . . Was credited with three tackles in the '16 Spring Game. 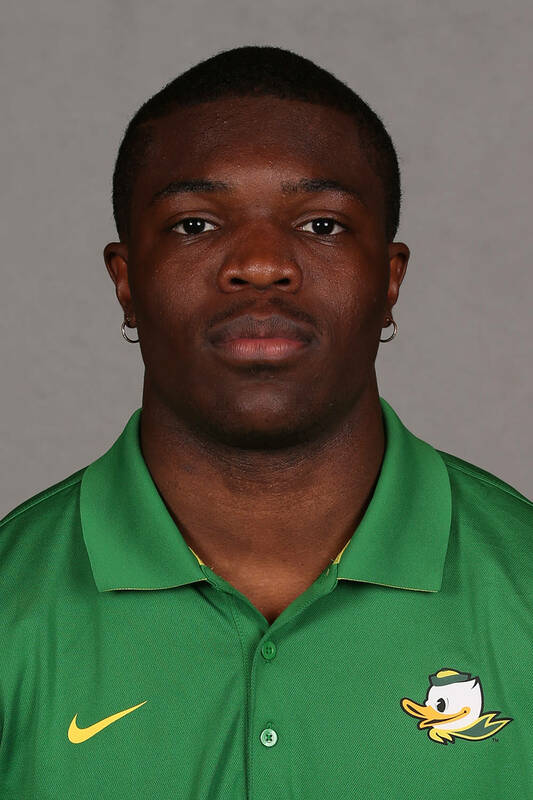 2015 — One of the Ducks' top reserve linebackers came off the bench in all 13 games to post 15 tackles, including 0.5 TFLs vs. Georgia State . . . Was credited with a career-high four tackles against Utah in only nine snaps . . . Took part in 25 plays against Georgia State and 20 at Colorado, registering two stops on each occasion, and accumulated stops in eight appearances . . . Included were 10 tackles during a four-week stretch against the Panthers, Utes, Buffaloes and Washington State . . . Work ethic during the off-season could position him for a more prominent role from the line of scrimmage as well as on special teams in the coming season as his style of play could become more conducive to the program's revamped 4-3 defense . . . Tallied one quarterback sack among his two tackles in the 2016 Spring Game. 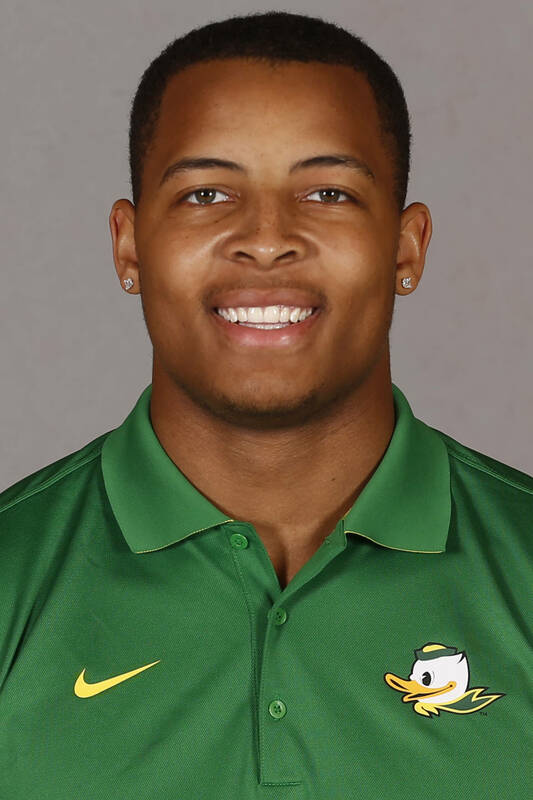 2015 — Began his collegiate career in the defensive secondary before he was switched to wide receiver in the spring of 2016 . . . Honed his skills on the scout team his redshirt year while coaches must feel good about his potential in order to move him to a position as deep as the Ducks' receivers . 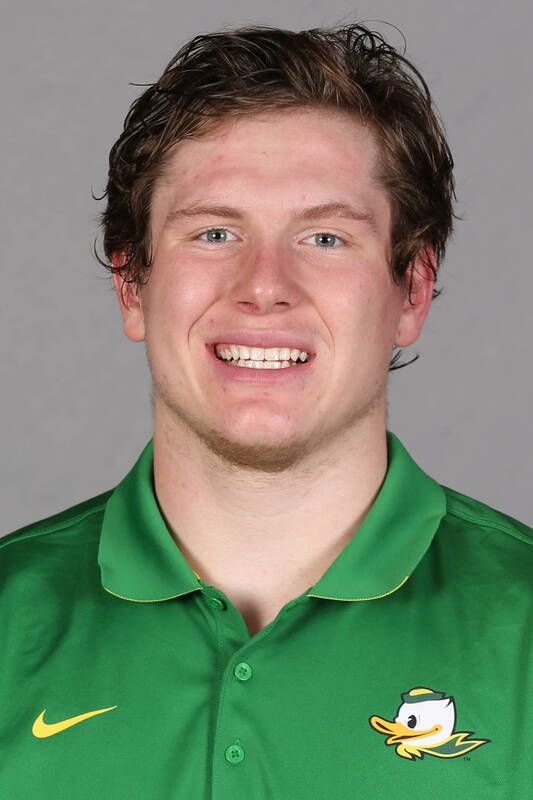 . . Was named the Ducks’ scout team defensive player of the week for his contributions to preparations prior to the game vs. California . . . Also demonstrated the attitude vital to becoming a mainstay on special teams. BEFORE OREGON — The 2015 PrepStar All-West Region honoree was chosen as the state’s top player at his position by Rivals.com and Scout.com as well as among Hawaii’s top-five overall prospects and the 43rd safety in the country by the latter recruiting service . . . Described as a physical player who combines size, athleticism and toughness with a great motor and work ethic for a team that finished second in the Interscholastic League in scoring defense (226 points) . . . Played a key role in the Warriors finishing 2014 as the seventh-ranked team in the state with a 5-3 record under head coach Doug Cosby . . . Doubles as a track & field standout as the state’s 2014 Gatorade Boys Track & Field Athlete of the Year was clocked in bests of 11.14 (100) and 21.92 (200) as a junior. 2015 — Stepped onto the field for all 13 games either from the line of scrimmage or on special teams, acquiring valuable experience behind a deep list of returning veterans . . . Grabbing receptions on five occasions, the Pac-12 academic all-conference honorable mention pick was credited with his first catch as a collegian the third week of the season against Georgia State, nabbing a pair of receptions for 25 yards vs. the Panthers . . . Also caught a pair of passes (10 yards) at Arizona State before picking up only one more catch over the course of his final five outings . . . Finished his freshman year with seven catches for 89 yards . . . Scored his lone touchdown of the year (43 yards) at Colorado to extend an Oregon lead . . . Experienced his most extensive action of the year with 66 snaps vs. Oregon State. 2014 — Graduated from high school early in order to enroll in classes during the winter term and attend 2014 spring practice . . . Made a positive impression on coaching staff during fall drills that left them feeling good about the ability to preserve his redshirt year . . . Grabbed three passes for 114 yards in the 2015 Spring Game. 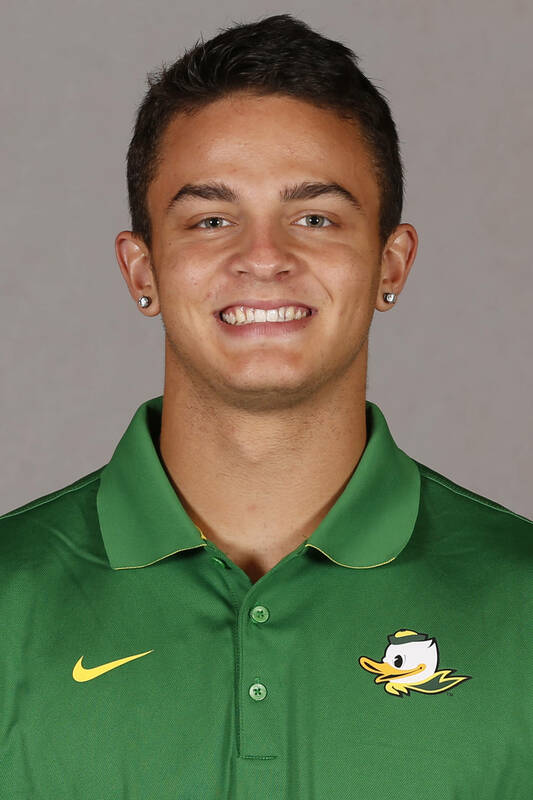 2015 — The walk-on first joined the football program his second year at Oregon following the start of classes for the 2015 fall term . . . 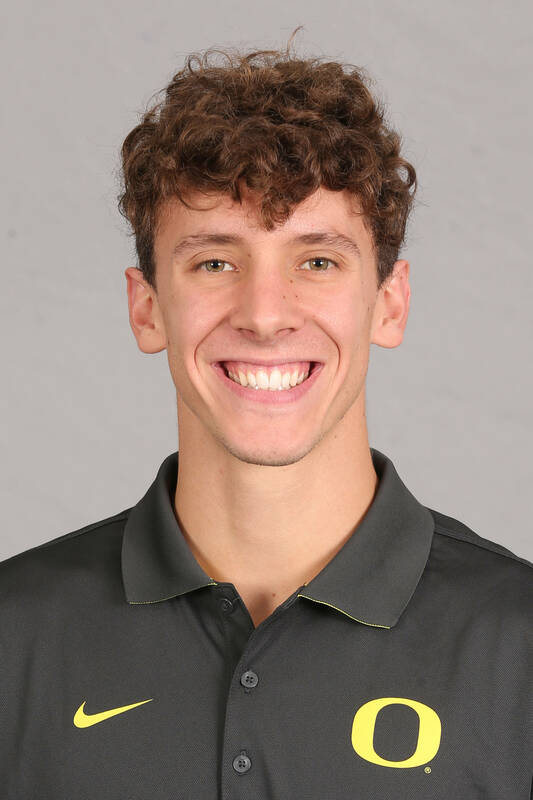 Spent his initial season with the program accumulating experience on the scout team as he was honored as the Ducks’ scout team offensive player of the week for aiding preparations heading into the game vs. Stanford . . . His off-season development was deterred the latter half of the 2016 spring due to a shoulder ailment. BEFORE OREGON — A football and track and field standout at Cocalico High School . . . Played quarterback and safety at Cocalico . . . As a senior, passed for 628 yards and six touchdowns, and ran for 934 yards and 18 touchdowns . . . Anchored the Eagles’ defense, recording 49 total tackles and eight interceptions . . . Hauled in 13 interceptions over three varsity seasons . . . 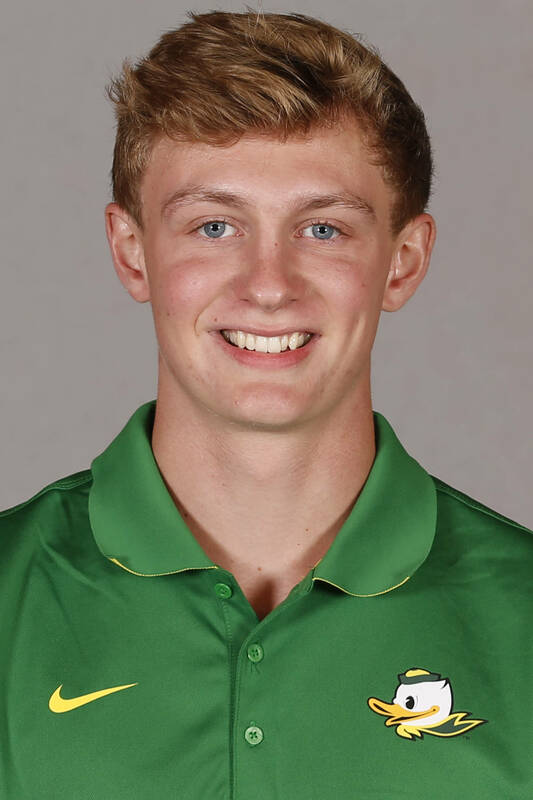 Joined the Oregon Track and Field program as a freshman and authored the eighth-best javelin throw in school history (227-5) at the Oregon Relays in April of 2015. 2016 — Held without a catch in the season opener vs. UC Davis but did run for 6 yards on one carry. 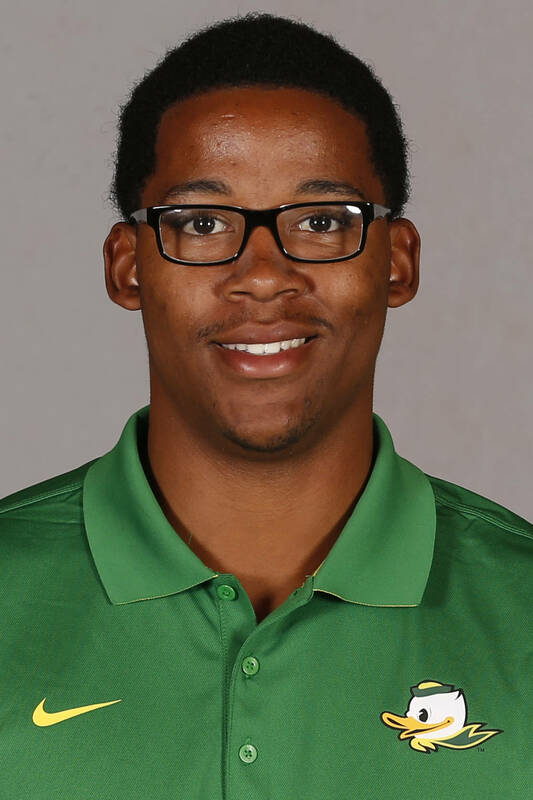 2015 — The former Travis Waller and early high school graduate began classes at the start of the spring term in order to get a jump on mastering the Oregon offense . . . Completed five of nine passes for 64 yards, including a 17-yard touchdown pass in the 2015 Spring Game . . . Added 11 yards on the ground on four carries . . . But it was an early-season foot injury that forced a premature end to his initial collegiate campaign and hampered his development . 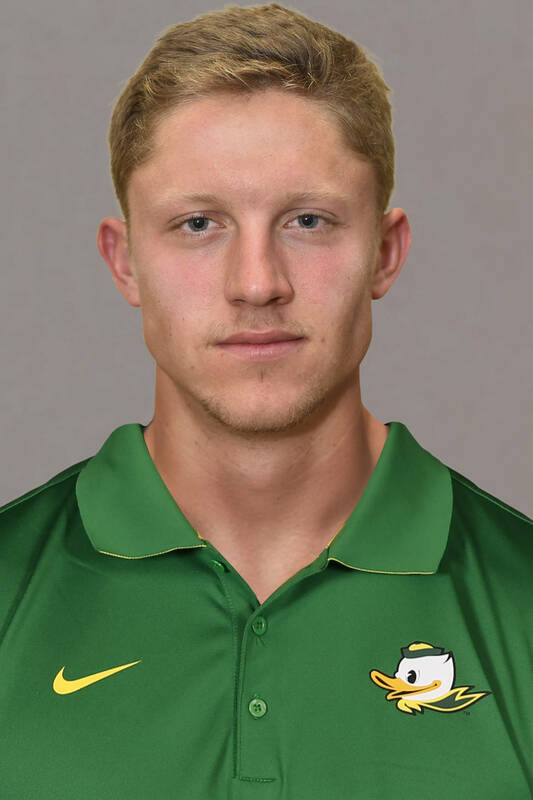 . . His 2016 spring proved to be more indicative of his potential when healthy as he locked into the competition as a starting quarterback at the Pac-12 level . . . Completed 15 of 24 passes for 188 yards and one TD in the '16 Spring Game in addition to running for 21 yards and a second score. BEFORE OREGON — The multi-sport standout ranks fourth among the state’s 2015 prep football prospects (ESPN.com) as the Southwest Conference offensive player-of-the-year attracted PrepStar all-West Region honors...Shared first-team 6A all-state accolades (The Oregonian) as he quarterbacked Sheldon to a 10-2 ledger his senior season after being chosen a second-team all-state first baseman in the spring of 2015...Threw for 3,130 yards and 37 touchdowns his final prep campaign while completing 66.5 percent of his passes, and ran for 543 yards (5.4-yard avg.) and 10 scores to lead the Irish to the 2015 6A state semifinals ...Included were season-bests of 475 passing yards and five TDs in the regular-season meeting with state champion Jesuit as well as 158 yards on the ground vs. South Medford...Completed 10 scoring passes in the first two games of his junior year before suffering a season-ending leg injury...Returned for the 2015 baseball season to hit .400 while scoring six runs and driving in 11 RBIs for a contingent that defeated West Linn for the Class 6A state championship...Also accumulated a 1.98 ERA in 42.1 innings, striking out 39 batters...Was a starter for the school’s basketball team that fell short in the 6A state championship game as a sophomore. BEFORE OREGON — Received Semper Fi All-America accolades as well as Greater New Orleans regional honors for the state’s second-ranked program that allowed only 12.4 points per game . . . Garnered 41 tackles in 11 games his senior season to earn a spot among the top 200 players on the 2014 ESPN 300 ledger . . . Included was a season-high nine tackles vs. St. Thomas Aquinas (FL) as he completed his prep career with 122 stops and five interceptions . . . Contributed 49 tackles as a junior, with his three interceptions including a 55-yard return for a score against Cohen . . . Characterized for his athleticism and instincts yet benefitted from his toughness and physical style of play to emerge as a solid tackler . . . The Patriots accumulated a 22-2 record the last two seasons under J.T. Curtis and captured Class 2A state championships in 2011 and ’12. 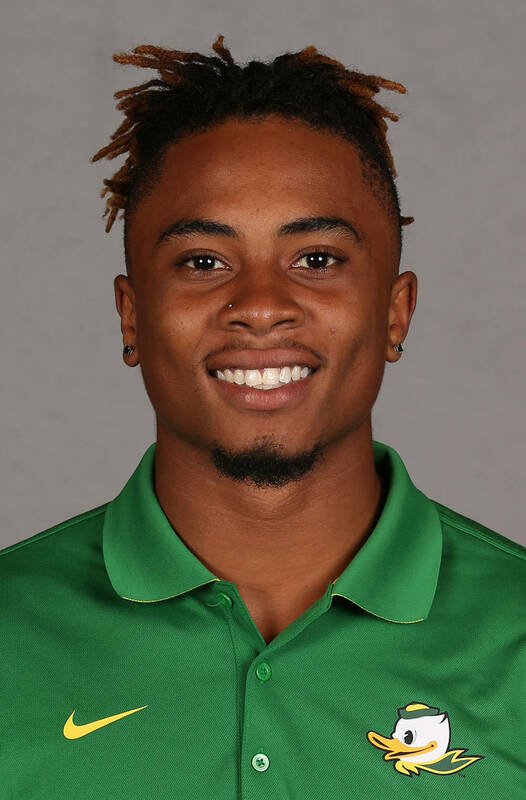 2015 — Oregon's most experienced returnee completed the year as its sixth-leading tackler (56) with the second-most stops among the defensive secondary despite missing two games . . . Included were 2.5 tackles-for-losses, posting takedowns behind the line of scrimmage against Michigan State, Stanford, and Oregon State . . . Ended the year second on the team in passes broken up (10) . . . Earning 10 starting assignment among his 11 appearances, notched four tackles (three solo) against Eastern Washington in the season opener before contributing what was then a season-high six stops (three unassisted) the following week at Michigan State . . . Contributed five tackles vs. Georgia State in addition to a pass broken up for the second week in a row . . . Recorded collegiate-bests of 10 tackles twice within a three-week span in wins at Arizona State and Stanford . . . Taking part in 941 snaps on the year, eclipsed 100 plays on three occasions . . . Included were 122 plays at Arizona State and 119 in the Alamo Bowl vs. TCU . . . Recorded five tackles in addition to returning an interception 34 yards in the 2016 Spring Game. 2016 — Enrolled at Oregon in time for the start of the winter term in order to get a jump on preparations for off-season workouts . . . Steadily improved his grasp of the offense as the spring wore on and demonstrated an infectious maturity that made those around him take notice . . . Made a habit of spending extra time in the film room in his quest to get better and possesses the motivation to succeed . . . Completed 20 of 29 passes for 190 yards while throwing for touchdowns of 31 and 32 yards in the 2016 Spring Game . . . Set program record for passes completed in a debut game, completing 21 of 30 passes for 271 yards and three touchdown passes and one rushing touchdown. 2015 — Oregon's second-leading rusher (570 yards) averaged 7.4 yards per carry in 12 games, including a 62-yard run at Colorado . . . Earning his first collegiate start in Boulder, demonstrated his explosiveness by carrying the ball 11 times for a season-high 110 yards and a touchdown in his most extensive action (30 snaps) as a true freshman. . . Also caught three passes for 41 yards . . . Almost accumulated a second-consecutive 100-yard effort the following week vs. Washington State, tallying 96 yards on the ground . . . Came off the bench late in the fourth quarter to rush for 60 yards on three carries against Eastern Washington in his collegiate debut, including a 61 yard run . . . 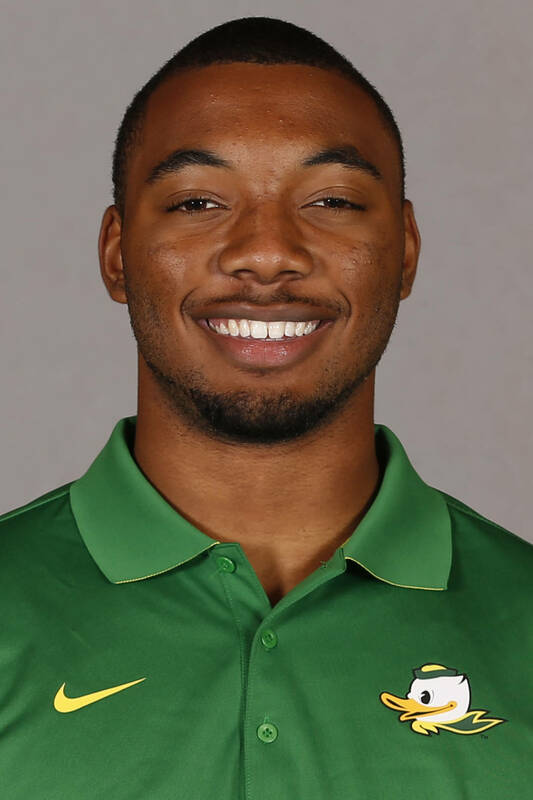 Contributed 56 yards on the ground and his first collegiate touchdown vs. Georgia State while adding scores against Stanford (49-yard reception) and Oregon State (14-yard run) . . . Added 91 all-purpose yards in the win over California . . . Graduated from high school early to facilitate enrollment at Oregon during the 2015 winter term . . . Took advantage of the off season to transition to the collegiate level although the rehabilitation of a pre-existing injury precluded him from participating in the 2015 spring drills on a full-time basis. 2016 — In his 9th consecutive start, against UC Davis, his preformance only strengthened his reputation as one of the team's most versatile players, serving as the team's holder for sereval extra points, 4 returns for 153 yards, and 4 punt returns for 98 yards. 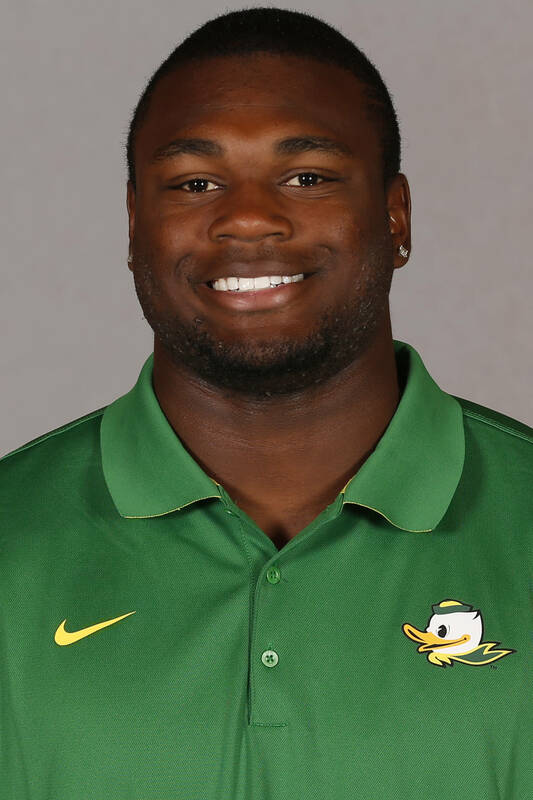 BEFORE OREGON — Ranked third among California’s junior college linebackers and seventh overall from the state by 24/7 Sports . . . Stood second on the team in tackles with 82 stops (45 unassisted) and third in tackles for loss (10.5) for the Tigers, who finished 2014 with a 10-2 record after falling to Mt. San Antonio in the California Community College Athletic Association Southern California regional finals . . . Also forced two fumbles and intercepted one pass before returning a fumble 60 yards for a touchdown vs. Ventura College . . . Was credited with a season-high 11 tackles against Saddleback College and in the year’s first meeting with Mt. SAC . . . The former rugby player posted 46 stops (34 solo), 10 TFLs and one interception as a JC freshman . . . The three-year starter at Citrus Valley High School completed his prep career with 173 total tackles for the Blackhawks, including a team-high 101 takedowns (17 solo) and eight quarterback sacks his senior year . . . Numbers included a personal-best 15 tackles vs. Yucca Valley during the 2012 season. 2016 — Graduated from high school early to facility enrollment at Oregon in time for the start of the spring term . . . Benefitted from going through spring workouts and demonstrated an accelerated maturity and understanding of the game that grabbed coaches’ attention . 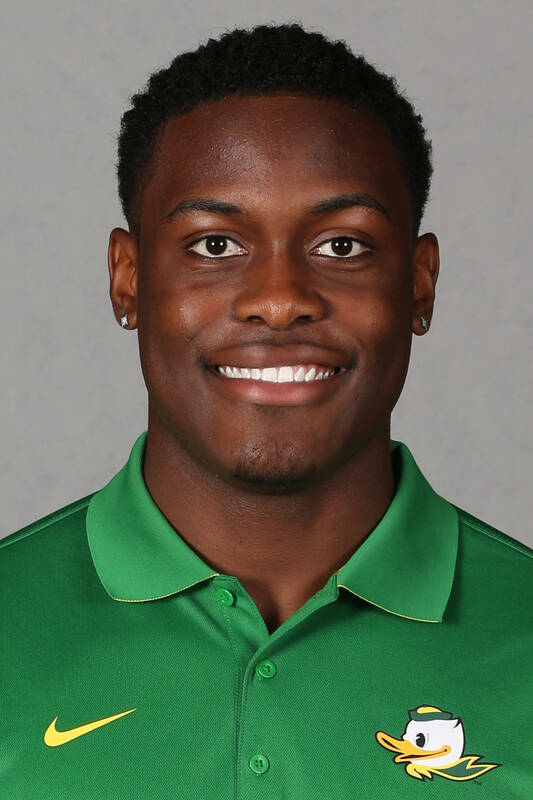 . . Possesses the skills as a dual-threat quarterback who appeared to waste little time adapting to the Oregon offense despite his numbers in the 2016 Spring Game . . . Completed four of 10 passes for 22 yards. BEFORE OREGON — Tabbed as the No. 1 prospect in the state and among the top 10 receivers in the country by Scout.com, the 5-star standout attracted inclusion among PrepStar’s Top 150 Dream Team, Rivals250 and ESPN 300 ledgers . . . The 2014 Missouri Gatorade Player-of-the-Year nominee became the fourth player in state history to eclipse 1,600 receiving yards in a single season and surpassed his own school record for receptions in one year his final prep season . . . Caught 96 passes for 1,611 yards and 15 touchdowns for the Bruins as a senior after grabbing 92 catches for 1,300 yards and 16 scores in 2013 . . . Senior-season totals included 14 receptions for 286 yards and four TDs vs. Lee’s Summit West . . . The 6A Offensive Player of the Year (Missouri Football Coaches Association) and first-team all-state honoree completed his prep career averaging 106.5 yards per game on 248 receptions . . . Benefitted from the tutelage of his father and head coach, A.J. Ofodile, who was a former tight end with the Baltimore Ravens. 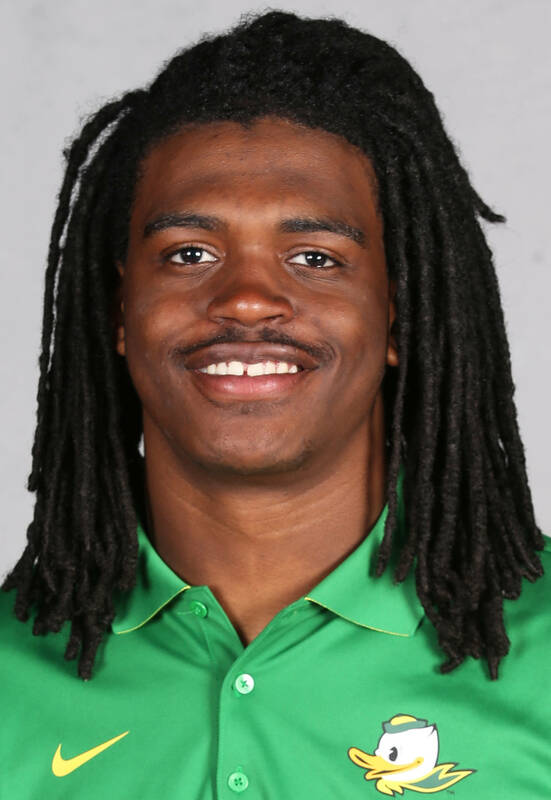 2015 — Emerging as one of the Ducks' most versatile defenders, his mid-season shift from safety to cornerback coincided with the team winning its last six regular-season encounters . . . 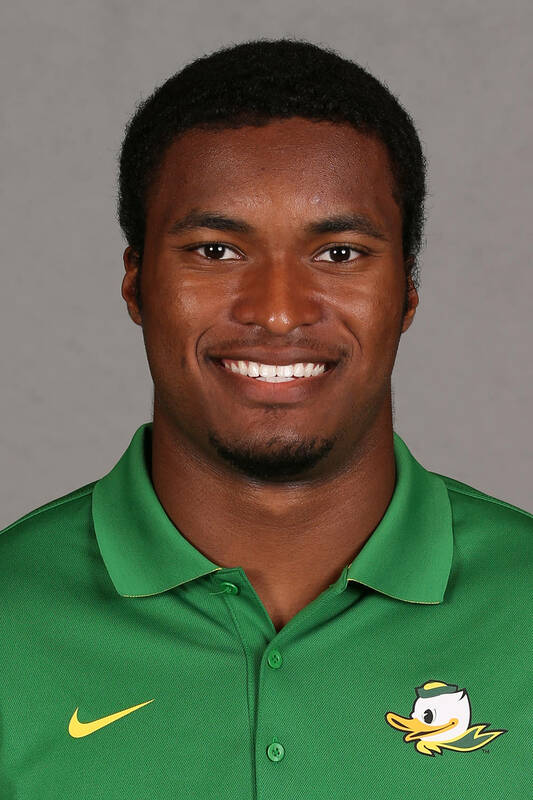 Appeared in all 13 games and finished the year as Oregon's fourth-leading tackler (64 stops) . . . Also led the program with three interceptions, including a 41-yard touchdown return among his two picks vs. Georgia State, as well as added a fumble recovery and nine tackles against Washington State . . . The 11-game starter led all tacklers with a career-high 11 stops in his cornerback debut at Washington in addition to sharing a team-high seven takedowns (6 solo) vs. California . . . Contributed four tackles and a pass breakup at Michigan State . . . Accumulated five solo tackles and an interception in the win at Arizona State . . . Tallied over 100 plays on three occasions, including 134 in Tempe. 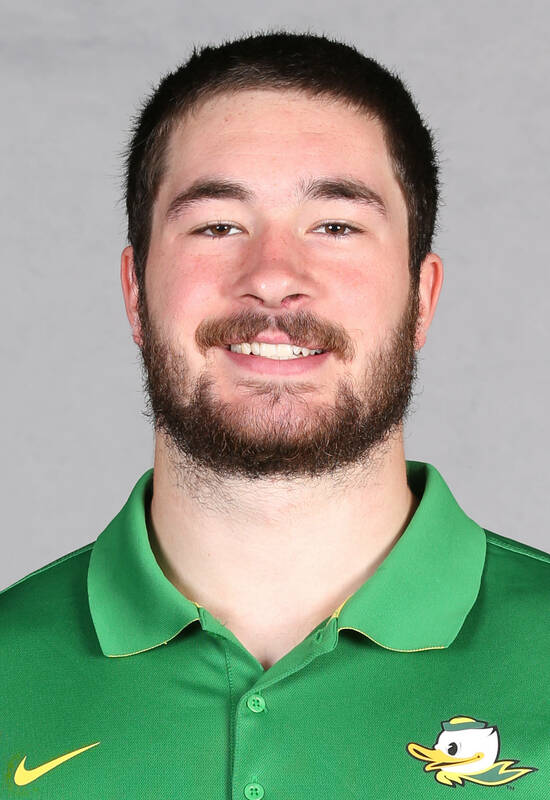 2016 — Joined the Ducks’ program prior to the start of spring drills, with the walk-on utilizing the 15 off-season workouts to gain a grasp of the Oregon offense. 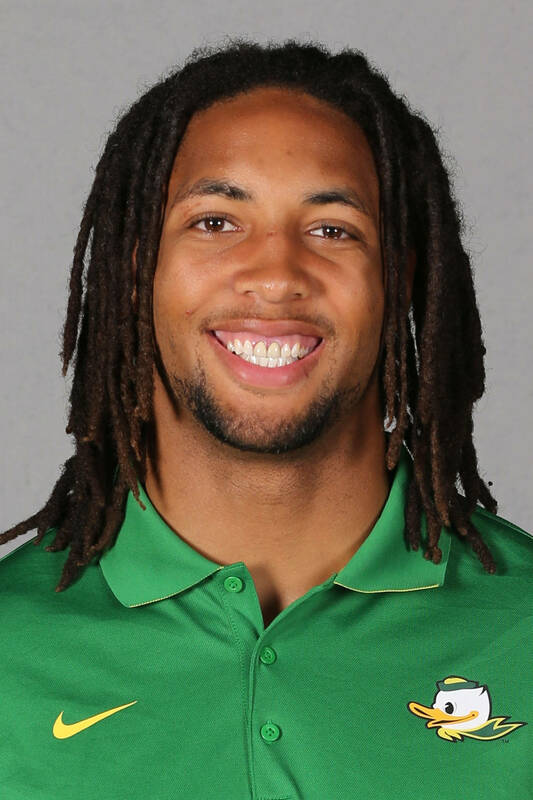 2015 — The nine-game starter finished the year as Oregon's third-leading receiver, grabbing 30 passes for 463 yards and five touchdowns ... Enjoyed one his most productive outings in the season-opening win over Eastern Washington while taking part in a collegiate-high 80 snaps, catching three aerials for a team-high 90 yards in the first half, including a 46-yard reception ... Hauled in his first touchdown catch of the season against Georgia State, followed by scoring receptions vs. Arizona State (2), California, and USC ... Logged his most catches of the year against Oregon State (5), and added four grabs against the Sun Devils and Trojans ... Manufactured his most memorable moments in the closing seconds in Tempe, pulling down an 8-yard catch in the back of the end zone with 12 seconds remaining to send the game with Arizona State into overtime ... . . . He followed with a 25-yard scoring grab on the first play of the extra period that provided the Ducks with a brief lead in their three-overtime win . . . Caught passes in 11 of 13 appearances, with five of his catches looming 25 yards or longer ... Missed all of the 2016 spring workouts while recovering from off-season surgery but expected back at full strength for the start of fall camp. BEFORE OREGON — The 2015 PrepStar All-Midwest Region pick was ranked as Minnesota’s No. 2 overall in-state prospect and the state’s best offensive tackle by Scout.com ... Also was considered among the nation’s top-27 defensive tackles by Rivals.com ... The Associated Press first-team all-state offensive line honoree helped lead the Islanders to a 12-2 overall record and the Class 4A Minnesota High School State Playoffs championship finals as a starter along both the offensive and defensive lines ... Team finished the year ranked seventh in the state under head coach Sean McMenomy ... Selected to participate in the 2015 Semper Fidelis All-American Bowl at the conclusion of the season, as well as the International Bowl in Arlington, Texas ... Named to the Minneapolis Star-Tribune’s preseason All-Metro Dream Team prior to the start of his senior season. 2015 — Provided his greatest contributions on special teams while adding to the depth along the defensive line ... Made appearances in 10 of 13 games, contributing tackles in two of them ... Credited with two solo tackles, including a tackle-for-loss, in the first game of the year against Eastern Washington ... Also added a quarterback hurry against the Eagles ... The second-team Pac-12 academic all-conference pick posted a pair of assisted stops vs. Georgia State two weeks after logging a career-high 42 snaps in the season opener. 2014 — Appeared in all 15 games while providing depth along the defensive line ... 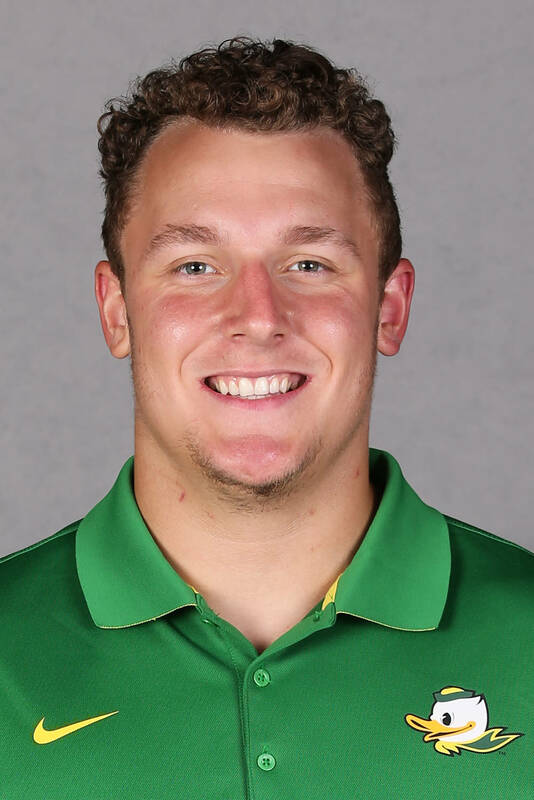 Recorded 14 tackles on the year, including a career-high five tackles and a quarterback sack in the Ducks’ regular-season match-up with Arizona while taking part in a season-high 52 snaps. . . Picked up a pair of tackles in each of two ensuing weeks against UCLA and Washington ... Added 49 and 43 plays vs. California and Stanford, respectively ... Completed a push to become a bigger factor in the future during 2015 spring drills, finishing the Spring Game with a team-high three tackles for loss among his five tackles. 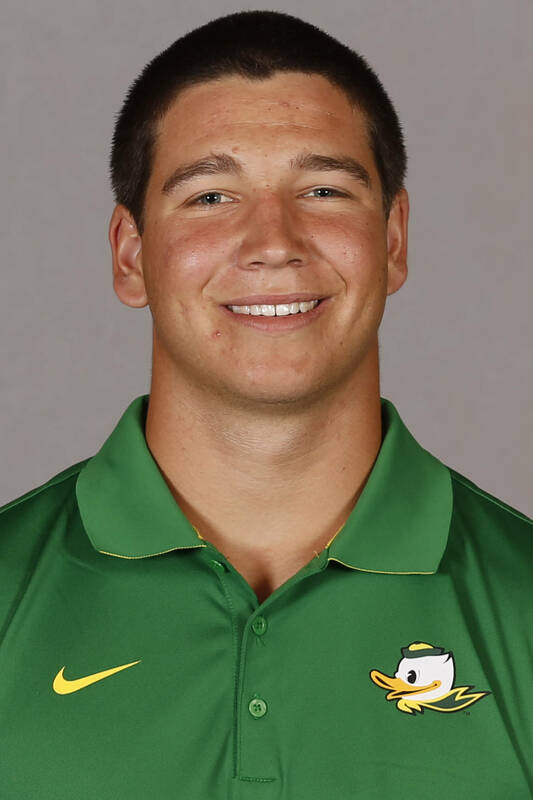 2013 — Redshirted his second season to allow him to adjust to the defensive line after being converted from tight end ... Named the Ducks’ Defensive Scout Team Player of the Year following the season ... Accounted for 0.5 tackles-for-loss among his five stops (2 unassisted) in the 2014 Spring Game. 2012 - Appeared in nine of the first 10 games, primarily on special teams ... Credited with first collegiate tackle in win vs. Arizona before returning to duplicate effort at Arizona State. 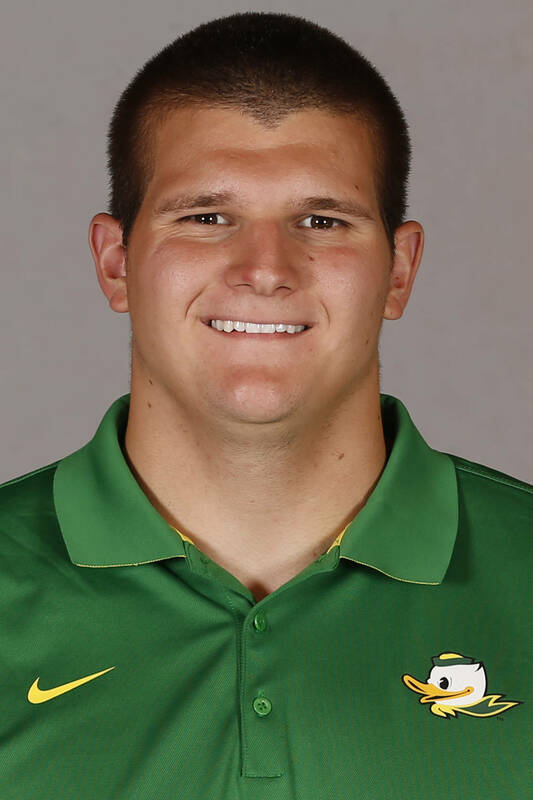 2015 — Became a fixture along the defensive front as the Ducks' lone underclassman in the starting rotation, posting 22 tackles while finishing third on the team in quarterback sacks (4) and fifth in tackles for loss (6.5) ... Opened seven of his 13 appearances yet ranked third among the defenders interior line in snaps (693), taking part in 118 plays at Arizona State and 95 in the Alamo Bowl vs. TCU ... The academic all-conference honorable mention choice was credited with a single-game best five tackles (4 solo) at Stanford as well as a trio of solo stops against Washington State and the Sun Devils ... Recorded two tackles for loss against TCU and accumulated QB sacks in four straight outings vs. Colorado, Washington State, Washington, and ASU ... Credited with his first recovered fumble as a collegian in Boulder, Colo., blocked a field goal the following week vs. the Cougars, and broke up two passes in the regular-season finale vs. Oregon State ... Emerged as one of the team leaders during the 2016 off-season workouts. 2014 — Made an impact along the defensive line as a true freshman, making appearances in all 15 games ... Credited with nine tackles for the year, including a pair of stops in each of three consecutive games vs. UCLA, Washington and California . ... Also added a tackle-for-loss against the Bruins ... Stepped onto the field for a season-high 29 snaps in the season-opening win vs. South Dakota before registering 19 plays at Oregon State ... 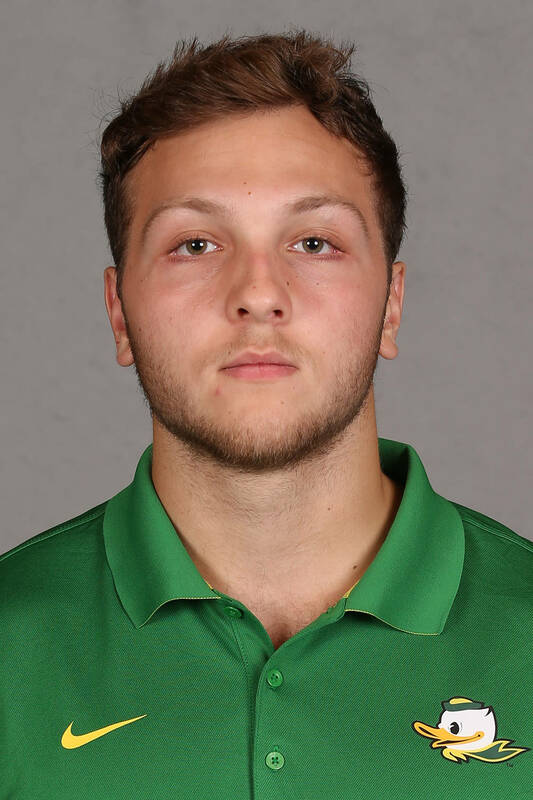 Deemed one of the defense's most improved players during spring workouts, the versatile Oregonian culminated off-season drills with three tackles (two unassisted) during the 2015 Spring Game. 2016 — Named to the watch list for the Polynesian College Football Player of the Year award . 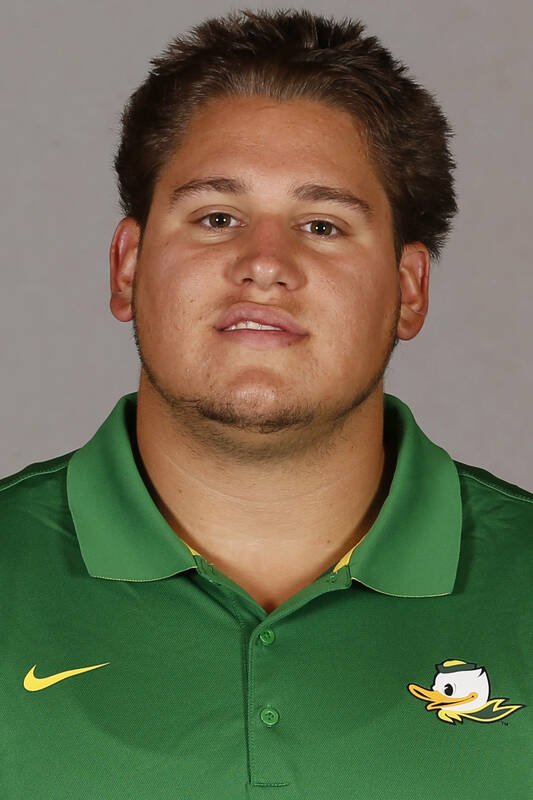 . . Preseason third-team All-Pac-12 pick by Phil Steele. 2015 — Was thrust into the rotation for on-the-job training in eight games in a situation that should pay greater dividends in the future . . . Posted both of this tackles (one solo) in the third game of the season in the win against Georgia State in his most extensive play of the year (26 snaps) . . . The highly-touted newcomer graduated from high school early in order to facilitate enrolling at Oregon in time for the start of the winter term . . . Demonstrated tremendous progress during the 2015 spring drills while recording five tackles in the Spring Game, including 2.5 tackles for loss and a game-high two quarterback sacks . 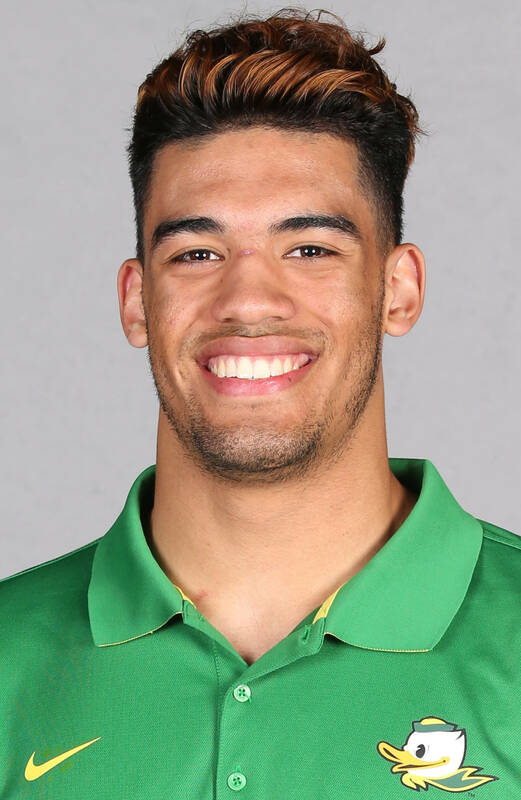 . . Added another QB takedown in the 2016 spring exhibition as he possesses the size to be an ideal fit for the Ducks' revamped 4-3 defensive scheme. Fotu T. Leiato II So.